After a day of pfaffing around on Tuesday we found a business here in Gore who had all the spare parts and skills required to fix the awning. 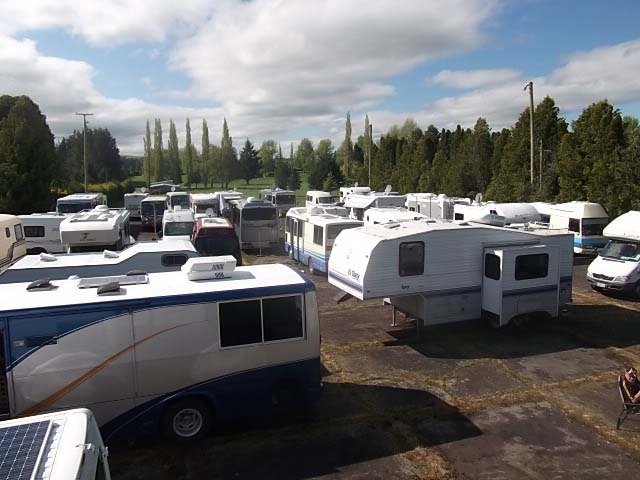 So Wednesday morning, we packed up the van and headed off down the road, first to the dump station then on to see Peter Wood at Charlton RV Imports. Within an hour or so, we had parts replaced, bits screwed back in, new pieces installed, all in all a very good job well done, relatively painlessly to boot. 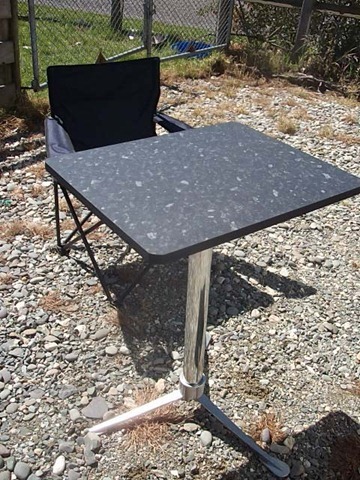 Whilst chatting with Peter, we mentioned that we were looking for a smaller table as the one we have is great for when we are stopped for some time, but just for the two of us, we could really do with something smaller. 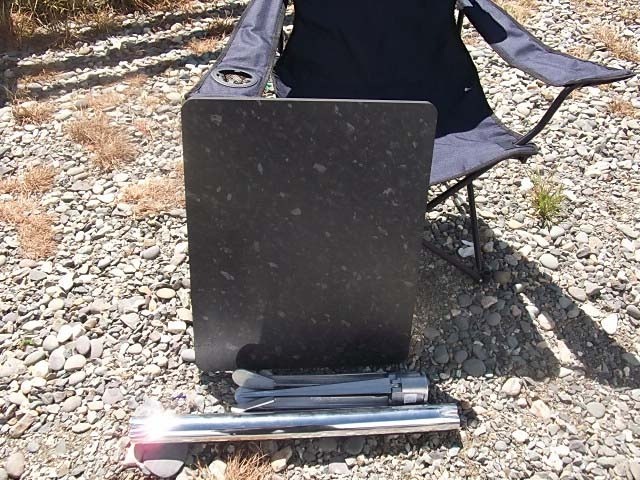 Ten minutes later we left with a folding tripod style base, centre pole and base for a table top. He sent us next door to a kitchen joiner to look for an off cut. Lo and behold, they had a piece which was roughly the right size and almost a perfect match for the bench tops and existing table. We left the fitting with them to attach and were to call back in the morning. Back to the van, and Bernice headed off into town to the library to avail herself of the free wifi whilst leaving Roy to get some work done. Spotted by Bernice, Thelwell eat your heart out. Thursday morning and the table top was duly picked up, we just had to paint around the edge of the table top to protect it. Off for a test pot of paint, then sitting in the sun and paint the edge. With it being such a lovely day we took the opportunity the seal off the awning repair with the special sealant for our motorhome roof material and to give everything a good check over, clean out the gutterings et al. That leads onto another handy hint we received, the spout for the small gutter that runs along the van has proved a little problematic as the spout does not extend far enough out from the van resulting in water running down the front side windows. After the heavy rain last week, Roy had started to fashion a complex aluminium extension for the spout, this was a work in progress. However, a simple solution has been found. By clipping a clothes peg onto the end of the spout, we have resolved the problem! Another wee task completed today was the removal of the “lovely” material on the surround of the slide out. 374 staples later, the material was removed and the wood replaced. Now it looks a lot better. We still have a small piece of material to replace on the two seater base, but we need access to a sewing machine for that. 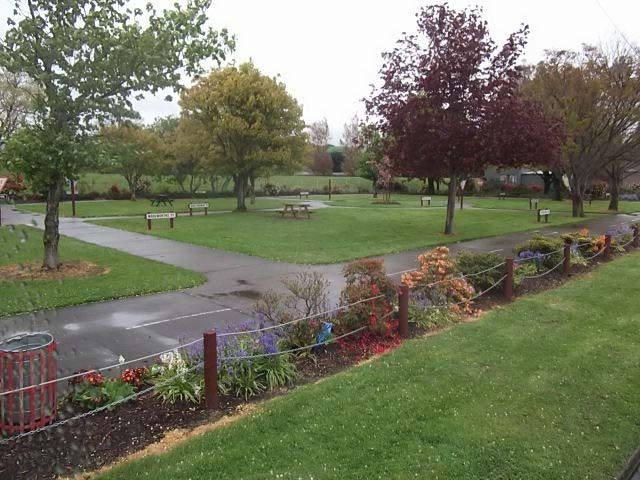 Having spent time at the Gore Town and Country Club park last week and this, we thought that it was quite quiet, as in all the time we had been here there had been a maximum of three vans at any one time. In fact most of the time there had been two, the other one having been here for some eight months. 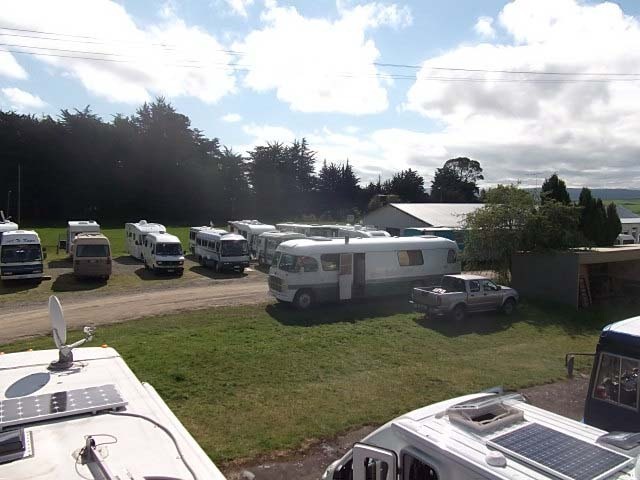 However last night put paid to that idea as motorhomes started arriving in late afternoon, We now have a total of nine here. 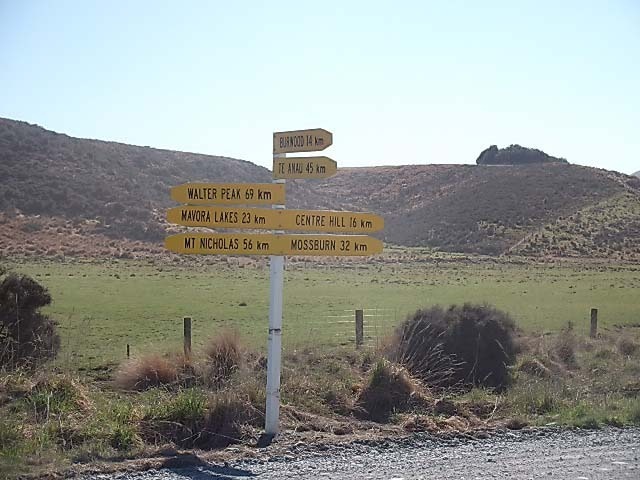 From Auckland, Waikato, Ashburton and Invercargill! Tomorrow, Friday, we are on the move again, plans may be changed on which direction we go, keep watching this space. 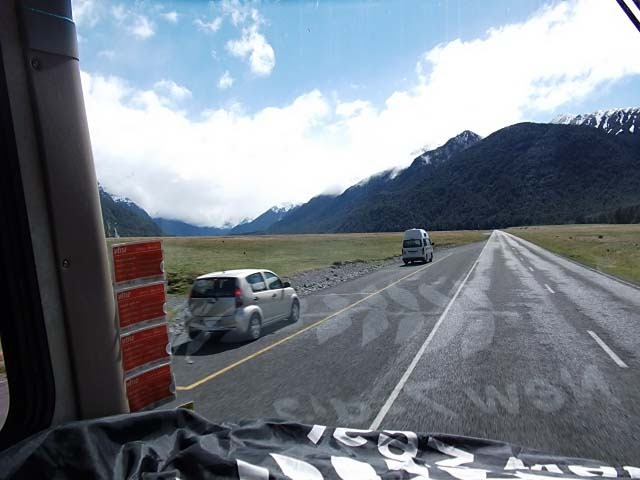 Here we were, minding our own business happily parked up in Gore when a bloody great freak gust of wind comes along, whips up the awning, rips the metal arms off the side of the van, pulls the attachment out from the top of the van and whips the whole lot on to the top of the van! Bugger. 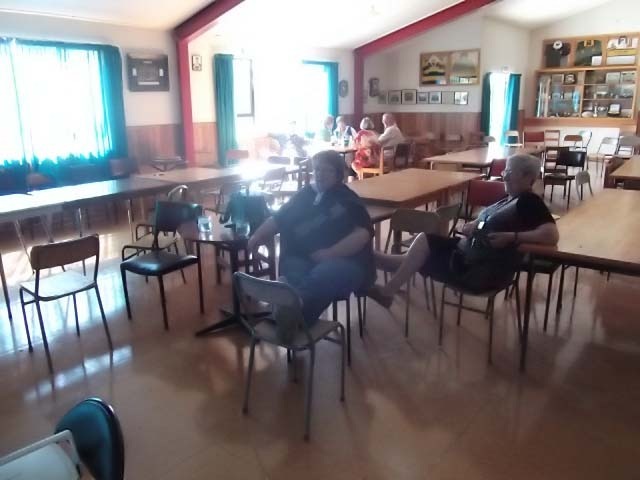 Prior to this event, we had had a fruitful day achieving a few things off the to-do list, washing done, supermarket shopping done and we now have a fully stocked up pantry, then we went off to Mataura for a quick look…what a depressing town, it really does need an injection of life and care. 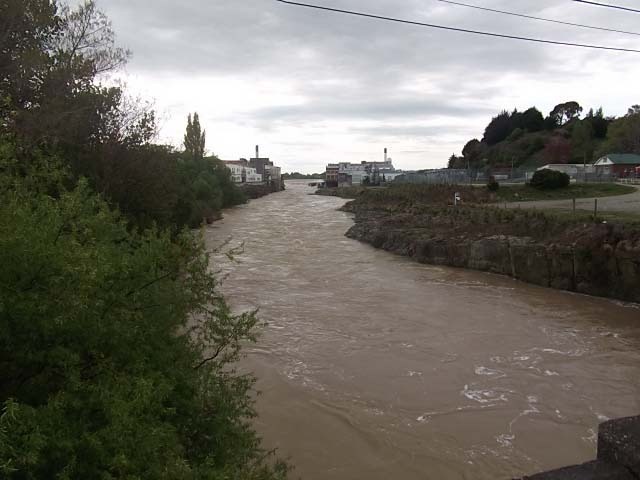 The mighty Mataura river after a few days rain. Anyway, back to the disaster. However, we were fortunate that the flailing metal arms did not break any windows, nor did they do any damage to the solar panels and they missed by a hairs breath, the satellite dish. Some consolation I guess. We went straight into damage control mode, lifting it all off the top of the van before attempting to patch it all together again. After 45 minutes or so, we had managed to get it all back together in mostly original position, and with a few handy cable ties, it is firmly attached to the side of the van. We rang the insurance company to get that side of things underway. 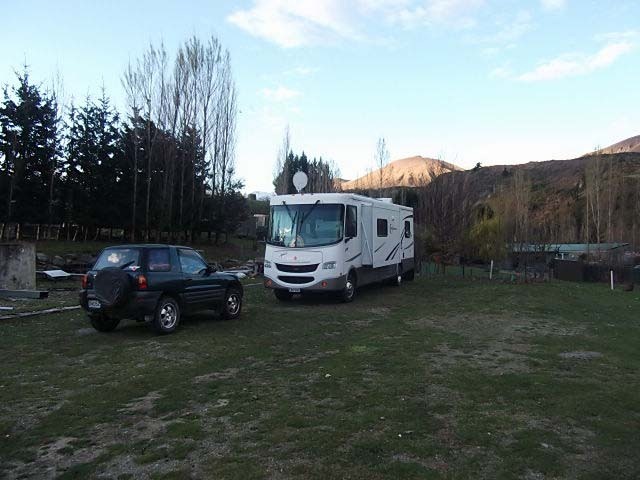 Friday dawned with some light rain falling but it was not long before we packed up and headed off for our weekend destination of Tapanui, where a motorhome rally was being held. Before leaving Gore we paid the mandatory visit to the local Dump Station which turned out to be situated alongside the best bicycle training area we have seen. It is a series of streets laid out with all types of road markings and signs for youngsters to practice their skills on without having to be on a public road. The road names are obviously local businesses that have sponsored the building of the the system. We arrived at the venue for the weekend, parked ourselves and headed into town to check out what was on offer. And what a surprising wee town it is. It is very tidy and well cared for, with just a few shops but all in all enough for what you need. 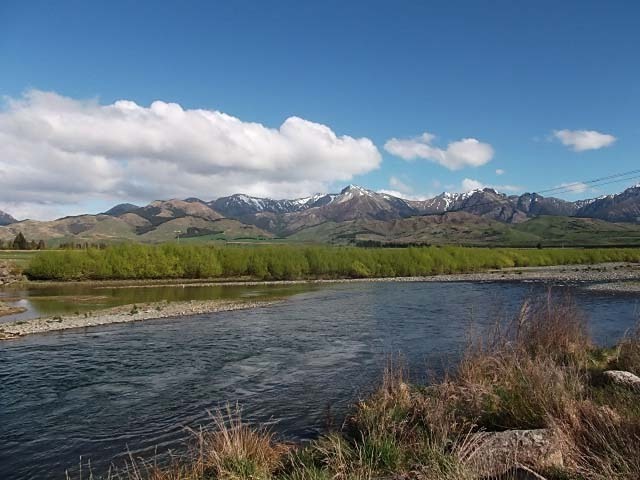 As a background, Tapanui is where the local GP did extensive research into a chronic fatigue syndrome, nicknamed Tapanui flu, or M.E. Back at the rally many many vehicles continued to arrive throughout the rest of the day, and a pleasant evening was had by all watching the Bronze final on the big screen in the hall. Saturday and the weather was really improving and turning into a lovely day. 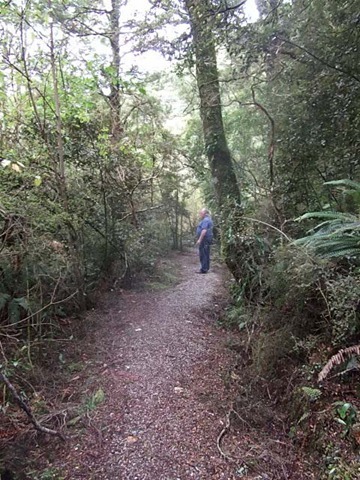 After the mornings activities we headed off for a look at some of the local sights, including a walk into Whisky Gully….where not a drop of whisky was found, although there was plenty of water. 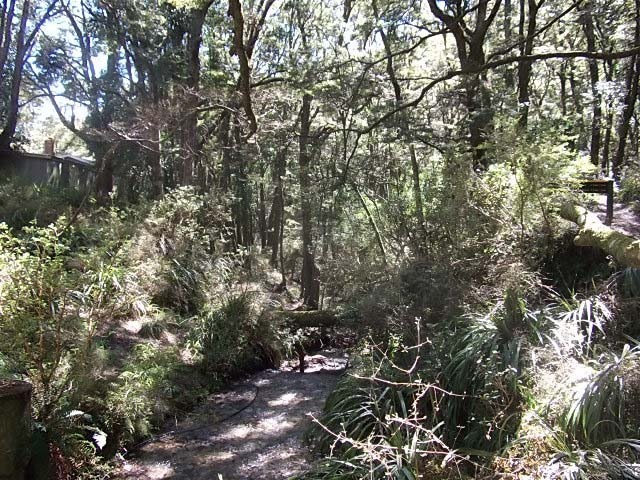 Whisky Gulley track through beech forest alongside a creek. Question: Roy what have you got in your pocket? Answer: i am just taking my (computer) mouse for a walk! Sunday and “the game” is on tonight. Although the netball is on in the afternoon which is also being shown on the big screen, but as someone pointed out, it is on at the same time as ‘happy hour’ so hopefully not too many distractions from the game. 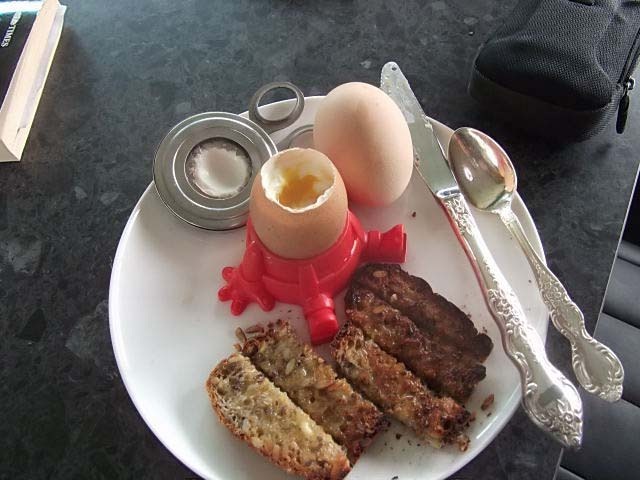 showing off her egg cutter bought in the market in Sedan, with the toast made by the toaster bought in Viuz-en-Sallaz…and of course les oeufs are from the partner of le coq!!! After the usual morning activities, we went for a drive to Black Gully where there is a lovely Domain and a perfect spot for parking. Although the locals have warned us that the sandflies can be vicious. From there we headed off to Kelso, where all that remains of the town is the main road and a memorial. 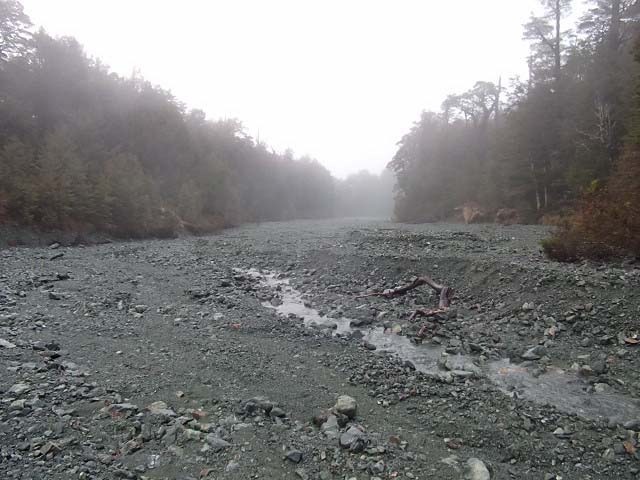 The town was seriously affected by flooding a number of times so after the last major flood in 1980, the town was removed. 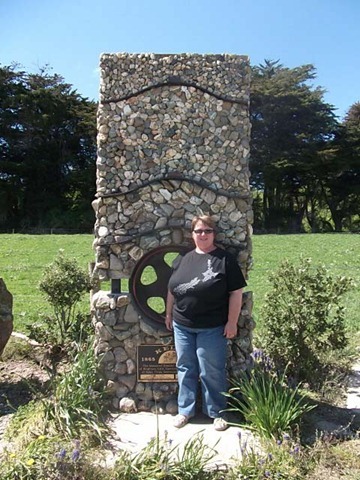 Bernice beside the monument in what was the main street of Kelso the peak bars show the height of the floods in, from top to bottom, 1980, 1978 and 1983. 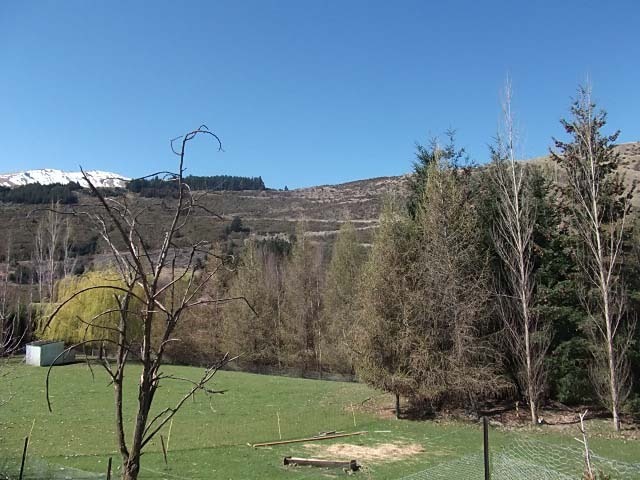 Another stunning day, and silly games organised for this afternoon between rival regions Otago, Clutha and Southland. Then an afternoon and evening of watching netball followed by rugby. Also climbed on the roof to clean the solar panels as a bird had been at work on one of them. So took a couple of photos of the vans at the rally. 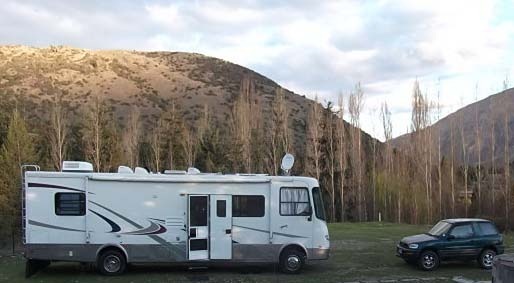 Observations: After having been to a couple of motorhome rallies now, I can see that we will have to make a few additions to allow us to assimilate a little better. Firstly, we will need a dog or two, not just any dogs though, little white fluffy yappy things seem to be the order of the day. 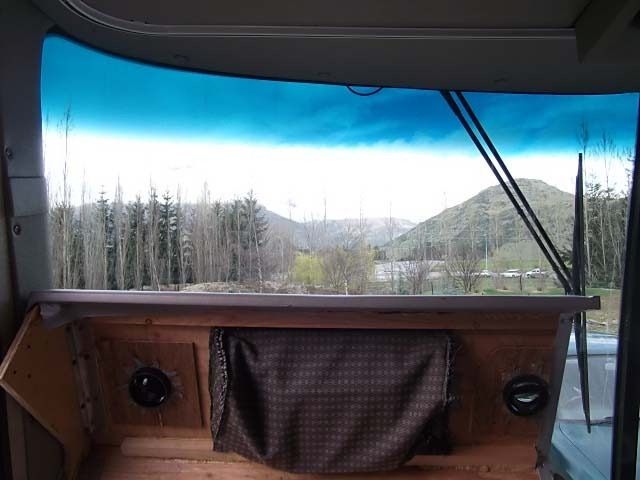 Next, we need a mixed array of stuffed toys to sit along the front dash, and the front window needs a little brightening up with the addition of a string of plastic flowers. Oh, and a few stickers on the windows and body of the vehicle would not go amiss. Crystals and dream catchers hanging at the windows would probably enhance the decor. Then, once we are parked up we will need the odd statuette i.e. gnome/fairy/dragon to sit at the entrance and a few of those solar lights to light a path would also be appropriate! Yeah right! Two nail biter, blood pressure increasing, heart stopping games later. Fantastic for both the Silver Ferns and All Blacks and even better to see some nationalism and patriotism throughout the country. 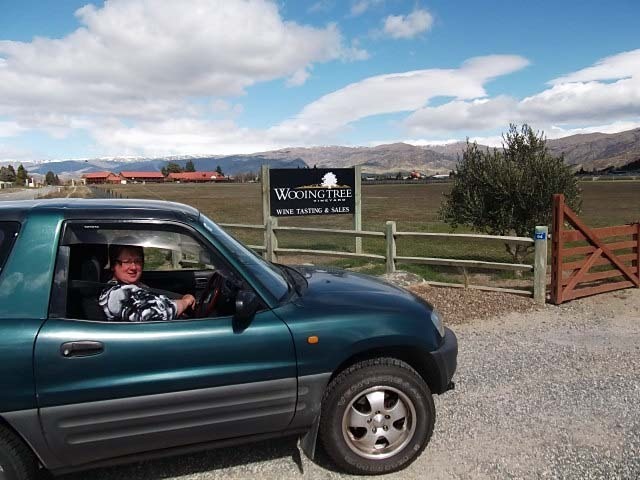 Monday and at a leisurely pace we headed off back to Gore but not before being buffeted by strong winds we were pleased to get to our parking spot. However, the winds only seemed to get stronger and stronger as the day wore on and by evening wore on, it was like sitting in a rocking ship! Tuesday and Wednesday we are still in Gore, hoping to get the awning repairs sorted and some work done before we head off again. Keep us posted on what is happening in your neck of the woods, we’d love to hear from you. Its not for everyone that I drag myself out of bed in the mornings, but Bill & Linda were due to arrive by 8.30am (yes, I know, not early at all for some of you but some of us like to enjoy a lie in). They arrived right on time and we spent the morning chatting and catching up with all their news. Linda brought us some sweets from the English Lolly Shop, and they also brought us a couple of Cornish Pasties that we will enjoy later in the day. 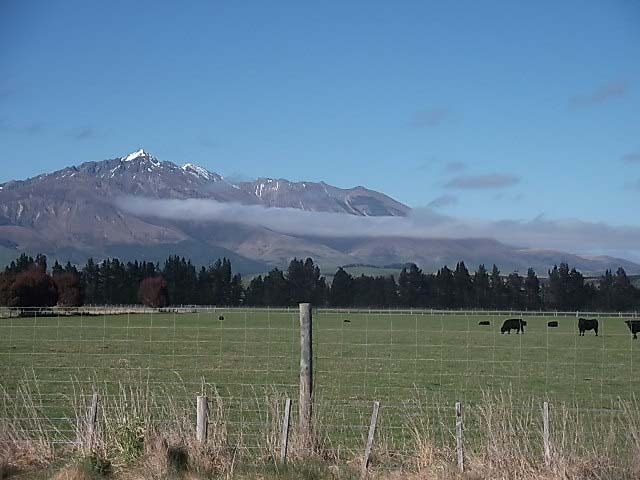 Of course it was yet another stunning day in Central but we had heard that the weather forecast was not very promising. With that in mind we thought we would head on to Mandeville and stay there for a few days. 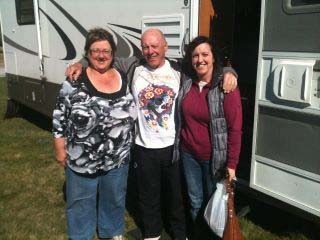 We said our goodbyes to Bill & Linda, packed ourselves up and headed off over the hills to Mandeville. 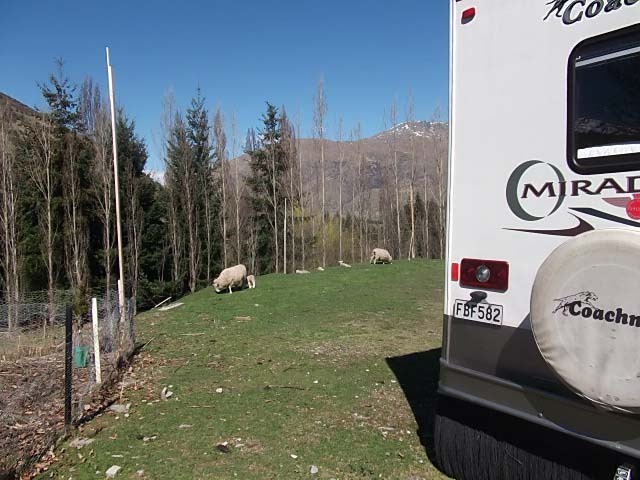 To ensure that the locking pins would have no chance of bouncing out of the A-Frame, we had some large rubber bands – made from old car inner tubes – that were given to us when we first bought the van by a fellow movanner, who told us that these bands would prove to be invaluable. How right he was. So with the bands wrapped tightly around the pins, we were off. We found the parking spot at the Mandeville Ponds and Wetlands area. 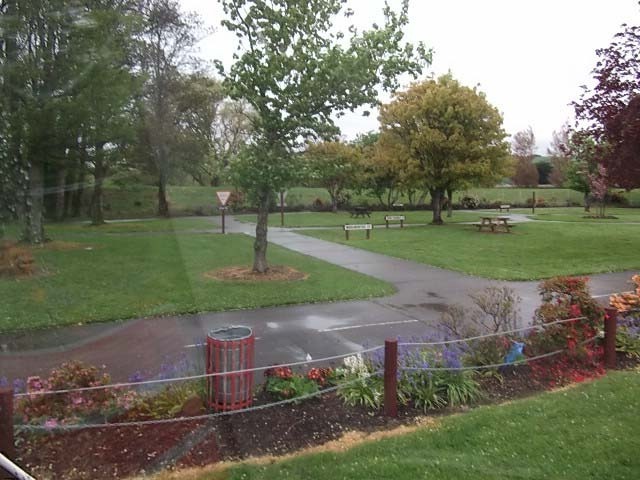 We set ourselves up right beside the ponds with a lovely outlook. However, just a few short hours later, the heavens opened and did not stop. Roy went off for a drive in the RAV to inspect a few more parking spots alongside the Ponds, as we were not too sure if we should stay on the grass with all the rain. However, we decided to stay put at least for the night. Mandeville ponds, lovely sunny afternoon or it was for a short time. Il pleut……it rained and rained all night, the ground was pretty damn sodden, plan A we would hop in the RAV, head into Gore and check out possible parking spots. Problem number one, damn RAV would not start. It sounded very odd, not at all like something simple like a flat battery, plan B, push the RAV into position, hook up to the van and drive the whole rig through to Gore. We arrived in Gore and quickly got the RAV sorted, a flat battery it was. Remember I said that Roy had gone for a drive last night to check out further possible parking spots? Well, he had left the lights on for some time, before noticing later on that they were still switched on. 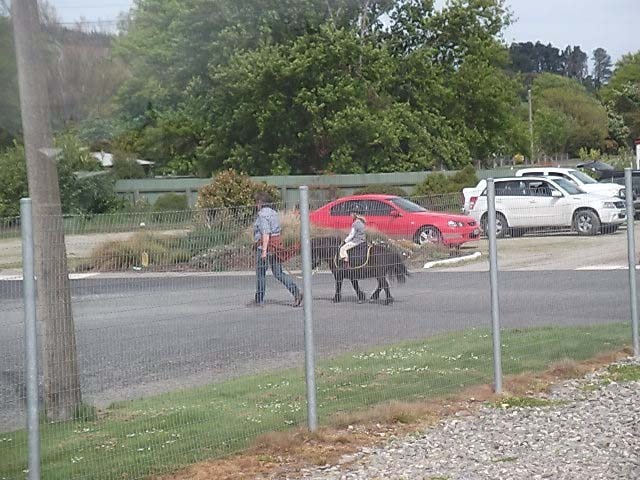 Underway again, off down the road to park up at the A&P Showgrounds, or across the Road at the Town & Country Club. 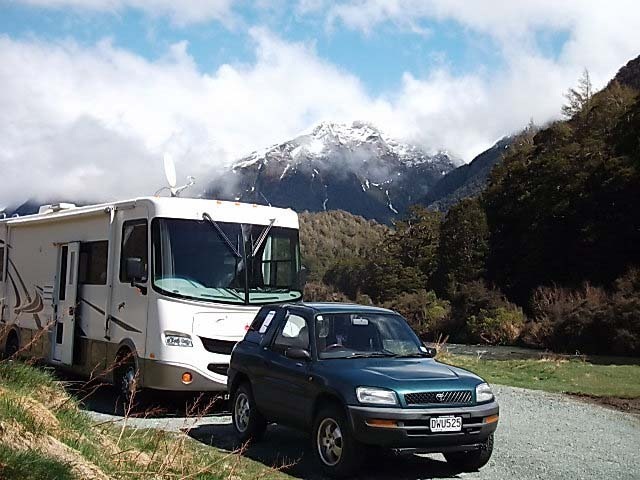 The T&C Club won out, with its separate car park for motorhomes, power to plug into, laundry facilities and showers & toilets as well. Sorted! Off into town and a visit to a few engineering places to see if we could sort out the locking pins problem. With lots of wonderful helpful advice and directions, we found an engineering shop that had pins with a hooking locking device, that problem sorted. 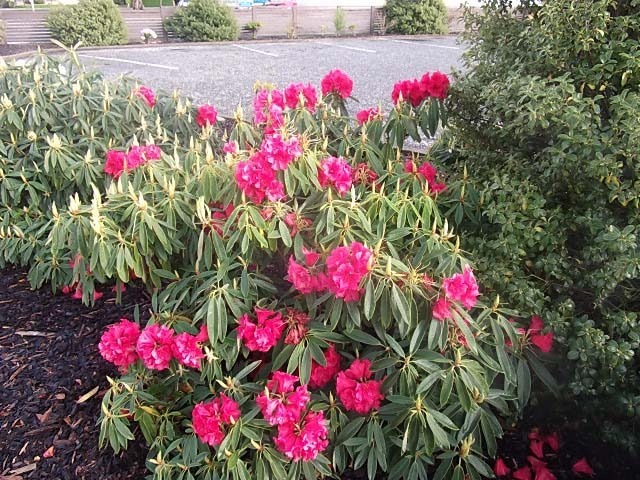 Apparently last weekend there was a Rhododendron Show at Gore. 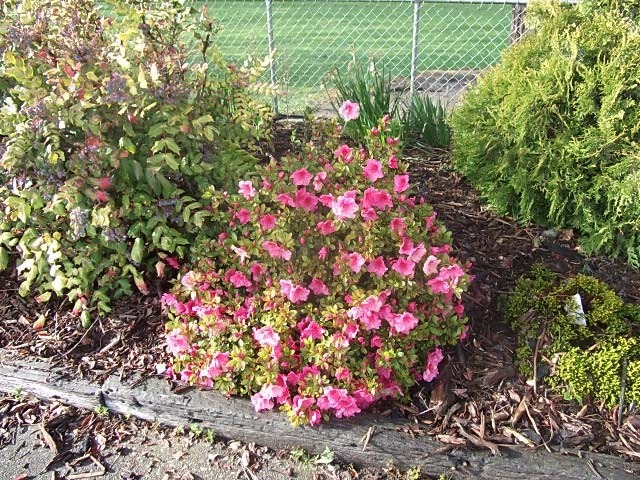 The following photos show some of the plants in the street and the Town and Country Club. We are now here for at least three nights, Gore has been a bit of a revelation, with nice shops, an amazing Art Gallery and very friendly helpful people. The Cookbook library has been extended after finding a great second hand book shop that had a great selection of newish cook books. And we also found some extra beaters and attachments for the faithful Kenwood Mixer. 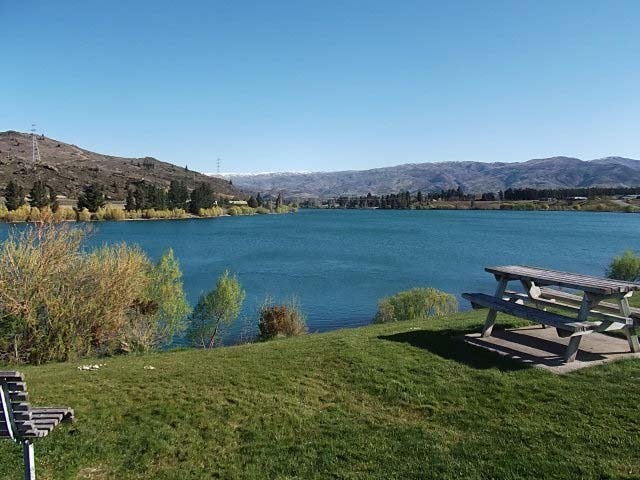 Glorious sunshine here today which is lovely especially when we read that the coastal areas of Otago and Southland are still being drenched. Why is it that even though it is wet and chilly, the damn sandflies are out and about? And why do they think I am delectable? 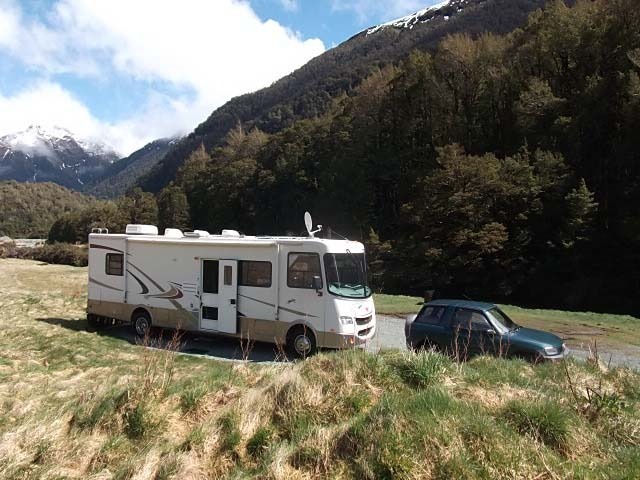 Thursday and we are parked up along the Cascade River on the Milford Road. 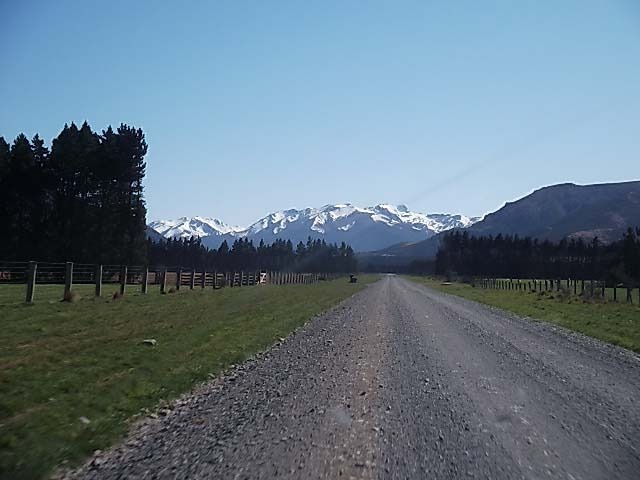 We spent Wednesday night in Te Anau at a POP so that we had good access to internet and phone plus we had to get a few items into the mail which necessitated a day spent around town. 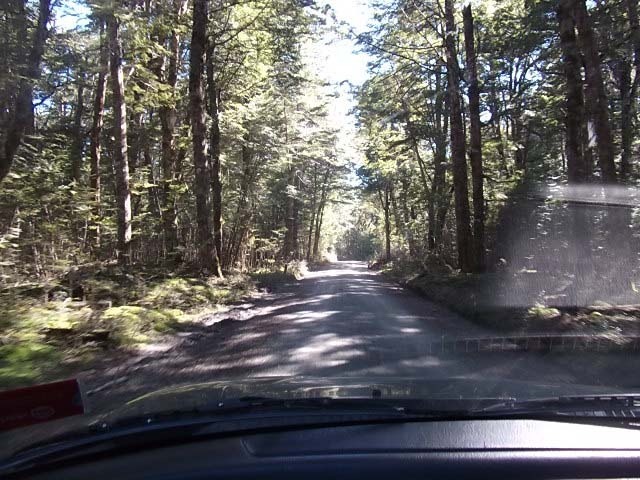 After we picked up our mail Thursday morning we headed out of town towards Milford Sound, deciding long ago that we would not go in as far as the Sound (been there, done that, many times) but instead concentrate on the drive into Milford which we think is the most scenic part. 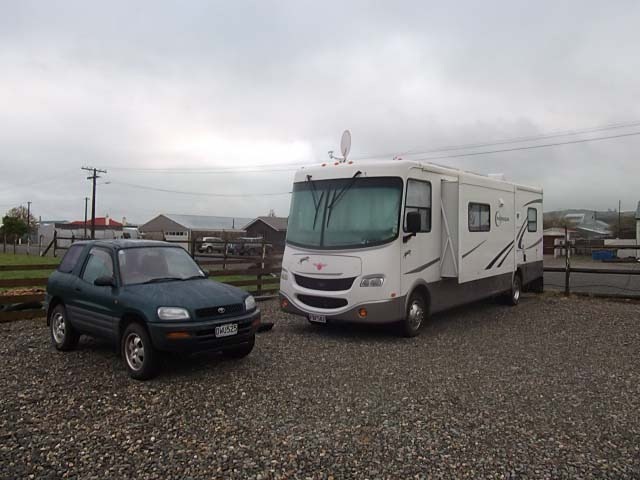 We headed for the furthest DOC camp site that we could comfortably fit into, hence our arrival at Cascade. We will then spend some time exploring this area before heading back and hopefully finding a few more likely spots on the return journey. 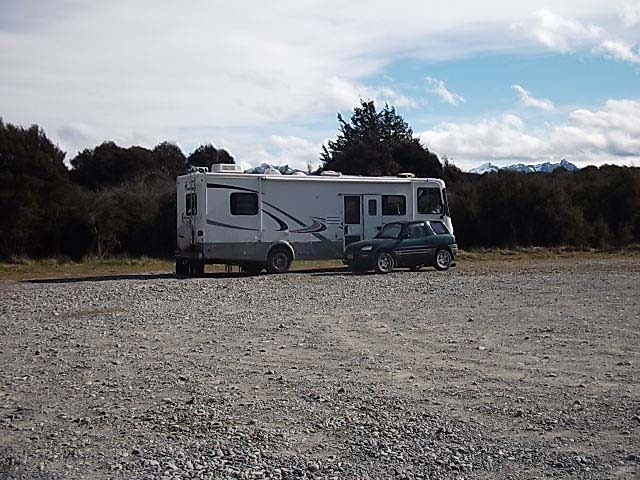 No the RAV is not towing the motorhome we are parked beside the outlet from Lake Gunn near the Cascade Creek bridge. 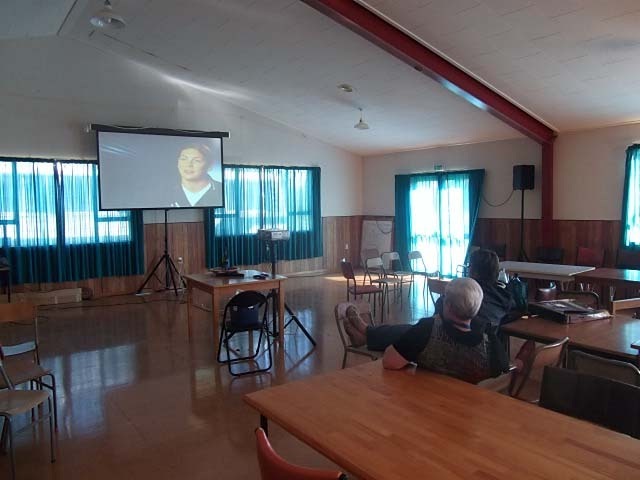 Of course, there is no cell phone or internet access here, but we do have TV reception. And we also have persistent rain, so it looks as though our plans for doing a few day walks are being scuppered. Instead, it seems like a good opportunity to make some muesli, as bread was made yesterday so we don’t need any more for a day or two, we still have plenty of biscuits and with the oven on, I can also organise dinner. Besides, it has decided to become very chilly, so standing in front of a warm oven is not a problem! In fact it is so chilly, that we have broken out the hot water bottles to warm up the bed. 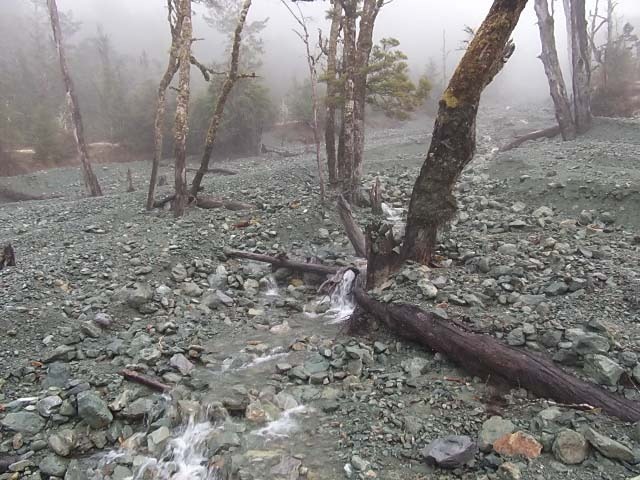 Looking down the scree slope to where the stream appeared to disappear. which it did here. 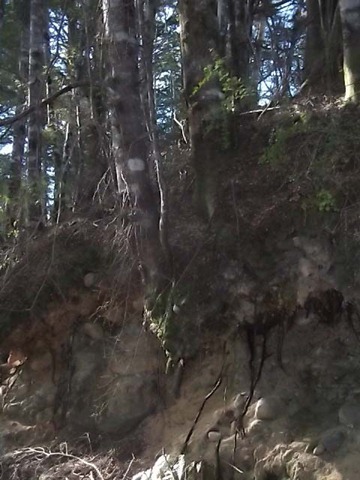 About 50 feet vertically from the river and over 200 feet horizontally. Not often a stream gets smaller as it approaches a river into which it feeds!! Friday (well, we think its Friday as we are losing track of days! 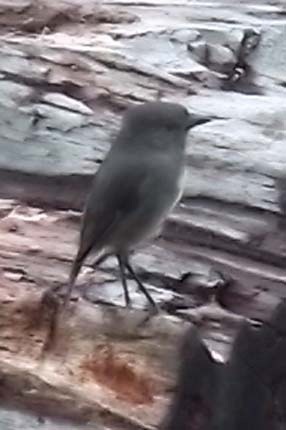 ), and overcast again, although the rain has stopped, but that just means that the sandflies are out in force. I have been eating vegemite to boost my Vitamin B levels as the sandflies apparently do not like this, but I may have to eat a bucket or two before it has any effect so it seems, I guess I will be their entree, main, dessert! Obviously my blood is sweeter than that of the male member of the expedition party. 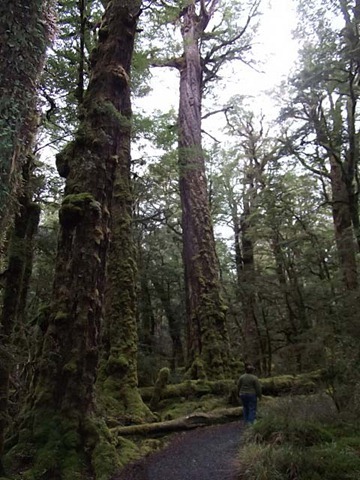 Went off for a walk to the south end of lake Gunn, through a lovely piece of NZ Beech Forest. Not before rescuing a French tourist whose car would not start (he was sleeping in his car no less) by jump starting his car. That done, off for our walk. Bernice showing great strength pushing over a Beech tree. 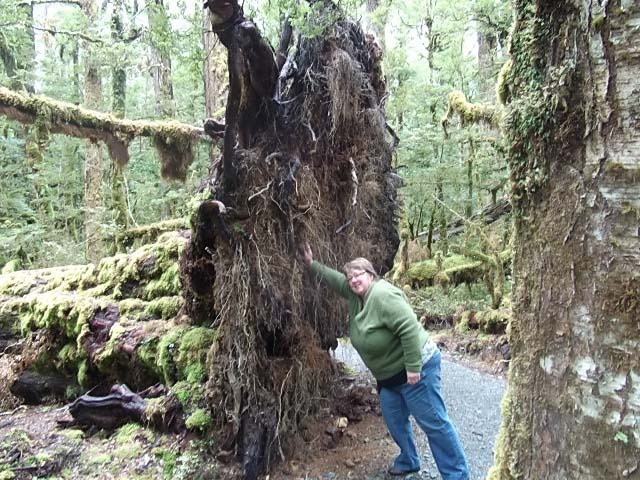 This one had only come down lately looking at the freshness of the exposed root system. 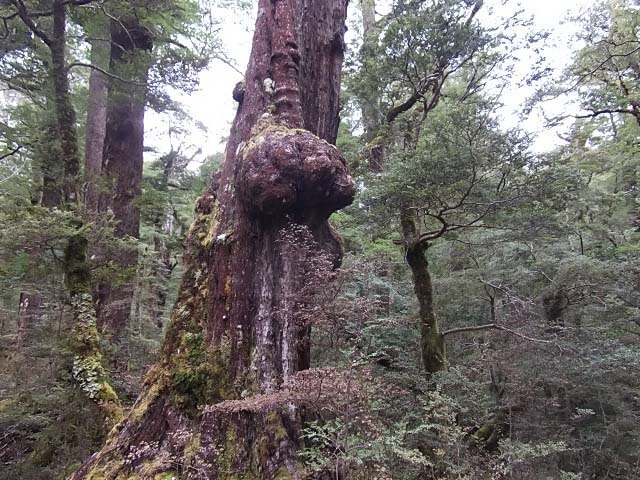 Many if not most of the Beech tress have galls growing on their trunks. 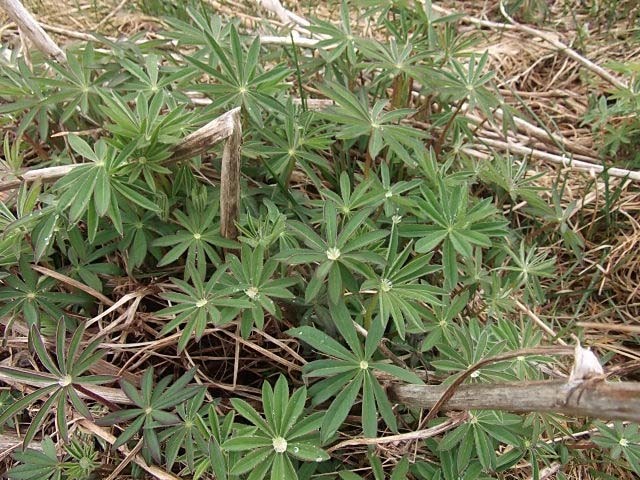 What causes these to grow has not been determined, it could be a virus, insect attack, self defence or a cancer. 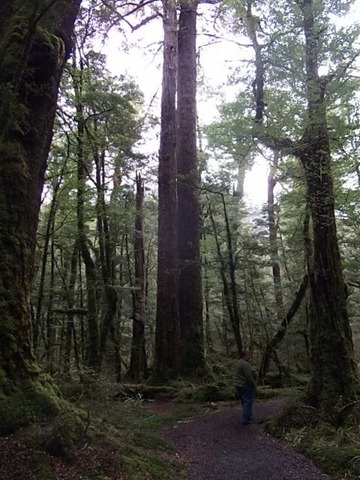 They can grow to a greater size than the width of the tree as can be seen in the first of these. 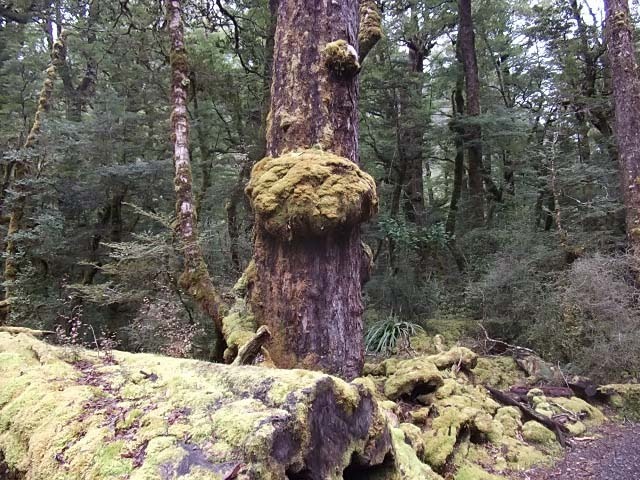 A much younger tree and Gall lacking the quantity of moss. 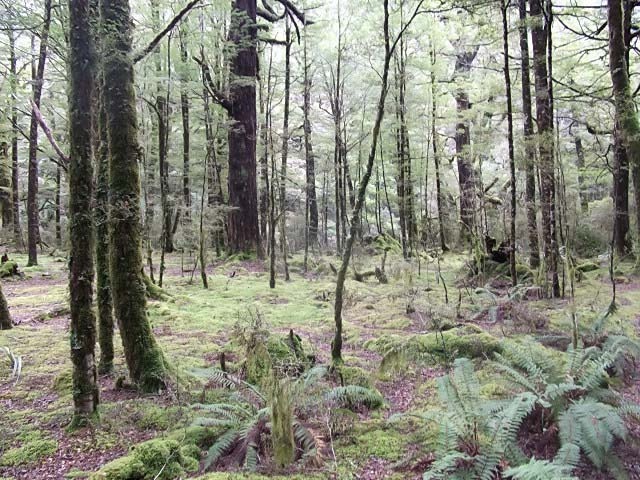 More open section of the forest. 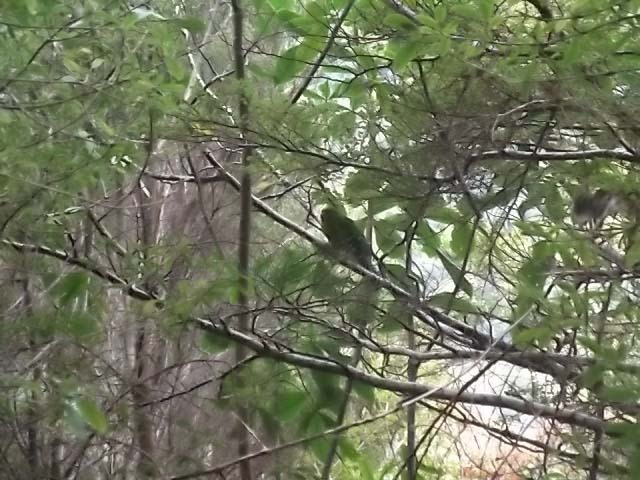 Green parrot somewhat hard to see. 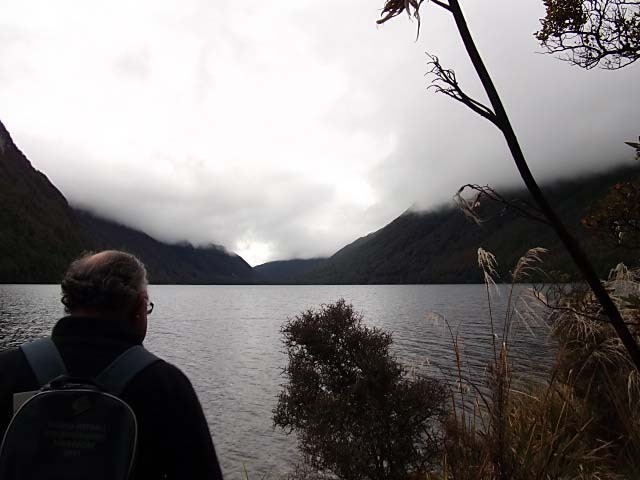 Looking up a brooding Lake Gunn toward Milford. 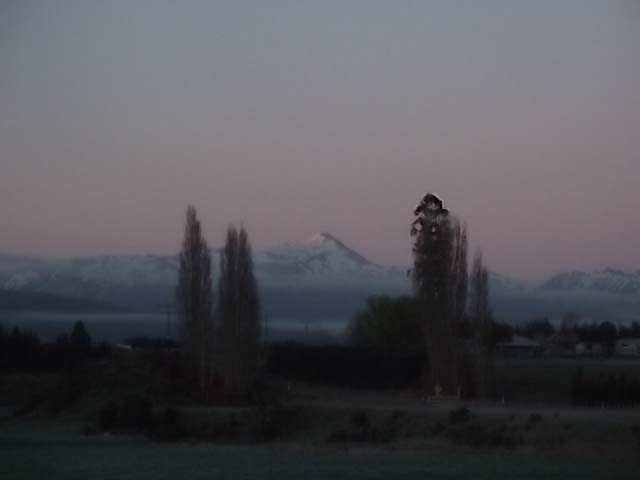 Saturday and back to Te Anau and the POP. Managed to catch up on all the washing and get it dried out in the sunshine before ironing ….yes, that includes the sheets! 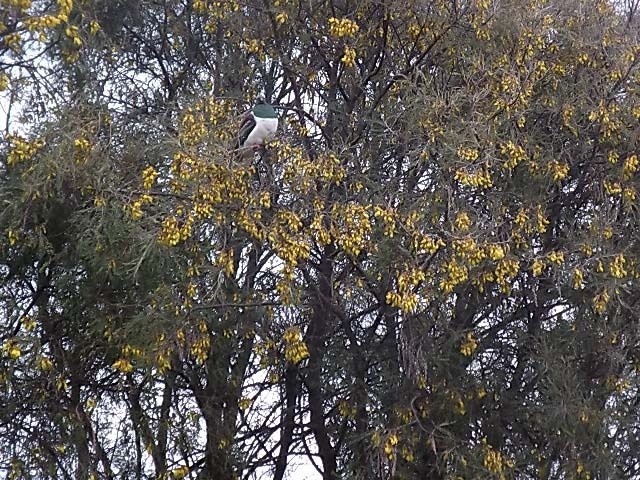 Caught sight of this Kereru in a Kowhai opposite the Dump Station. Jude & Shaun along with their youngest son Andrew, came for a visit as Shaun had not seen our new abode. We even watched the cruel Wales vs France Semi Final, only hope that tonight is not like that! Sunday and making our way to Fairlight. This is where the Kingston Flyer runs through to and this will be our rest stop for this evening (oooh, that sounds like the Amazing Race!). 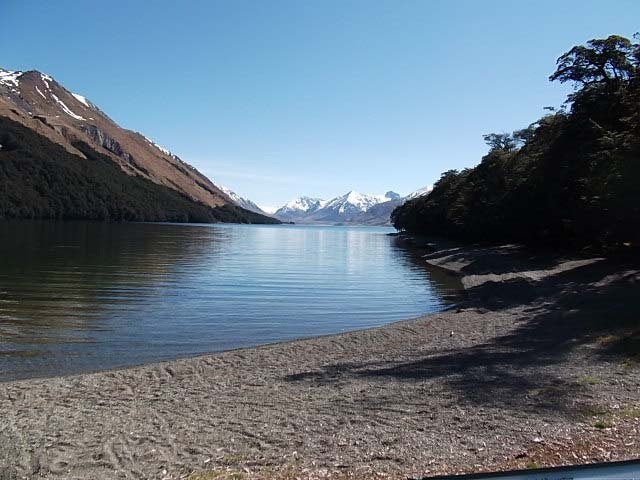 Tomorrow we will be meeting up with Bill & Linda who are down in Queenstown for a short break. 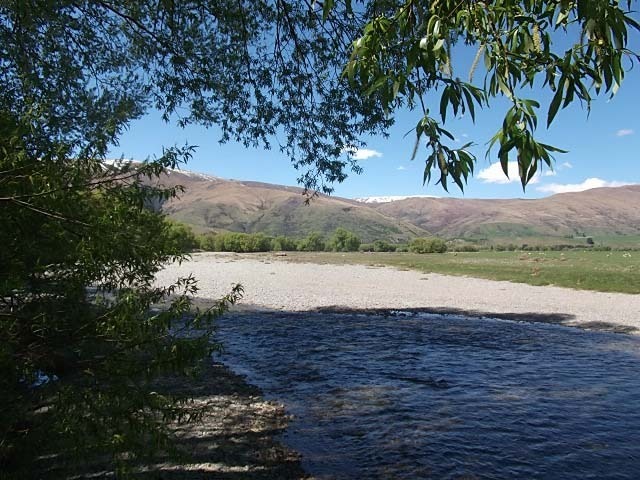 The Mataura river looking upstream. Went for a walk up here and found a lovely pool with two resident trout calmly waiting for lunch. 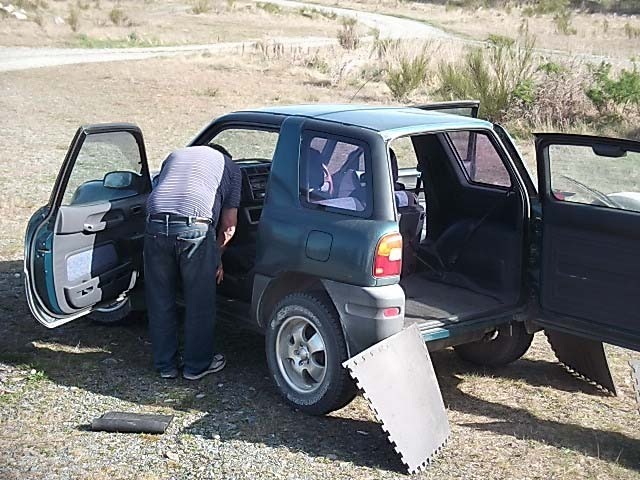 Along the way, we somehow managed to 1) find the locking clip for the A-Frame that we lost a week ago, found at the Mararoa River parking spot, 2) lose a locking clip further along the road! Just as well we stopped when we did before the pin was dislodged from the A-frame, it could have been very messy! Now we have to figure out a way of stopping the damn pins from coming out again. Monday dawned a dullish overcast day which seemed a good day for Roy to get on with the accounts and GST returns et al. And as anyone who knows Roy well will know that this means he will not be in the best of moods and should be kept clear of at all costs. 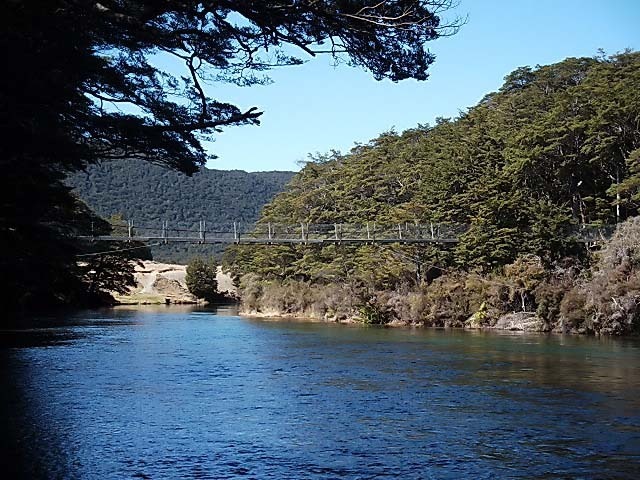 With this in mind, Bernice beat a hasty retreat into Te Anau with a long shopping and ‘to do’ list. 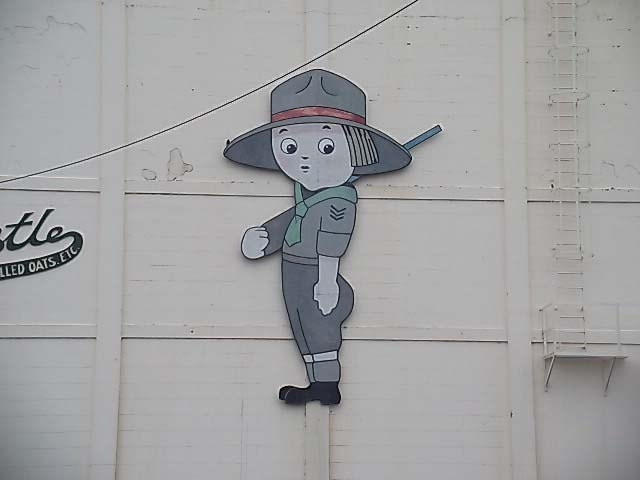 Whilst driving from one task to another, I happened upon a familiar looking person walking along the street. 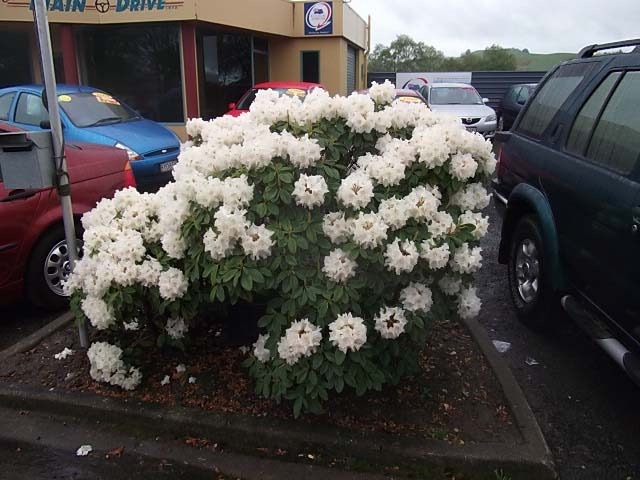 Pulling up beside her, it was indeed Judith Cantwell (nee Amos), whom we have known since Tokoroa days. After a lengthy chat on the side of the road, we exchanged contact details and I invited her out to visit us at our park up spot next to the Whitestone River. 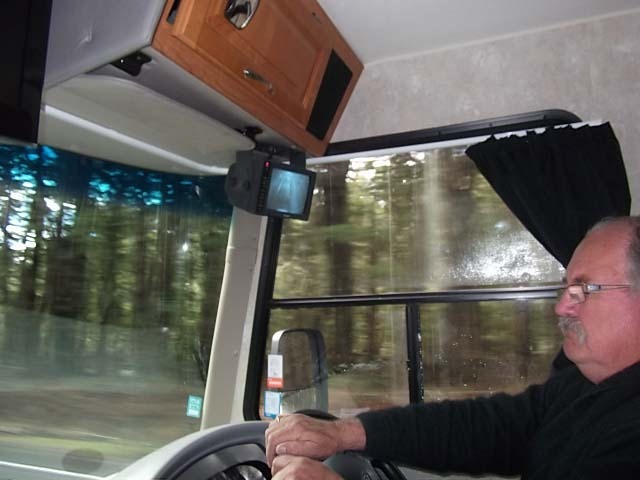 Back to the tasks in hand, including laundry, once all jobs were ticked off the list and complete, I headed back out to the van in the hope that Roy had completed all he needed to do. No such luck! But by the time, I had hung out the washing, put away the groceries, organised a late lunch and got dinner prepped, he had finished everything. We decided to have a late dinner due to having had such a late lunch, however, it turned out to be a little later than we anticipated as Jude and her youngest son Andrew came for a visit. 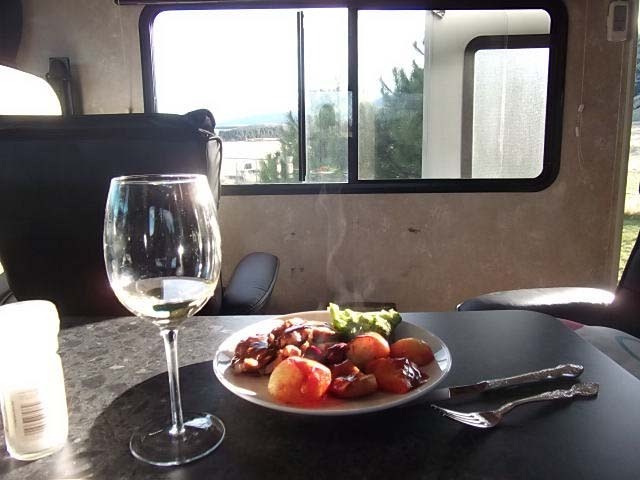 By the time we had chatted over a wine or two (a VERY good Hyperion Gaia 2004 Merlot – thanx John Crone! ), caught up with all our news, it was nearly 10.30pm. So a very late dinner, but the lamb shanks were exceptionally good I have to say, and meltingly tender. Tuesday morning and we packed up the van to head into town to empty the waste tanks, fill up with fresh water and load up with LPG. We also had to post off all the bumf from yesterdays workings and check to see if our mail had arrived. Negative to the latter but we managed to get everything else done. Whilst at the dump station we met a lovely young Australian couple with their three preschool children doing a tour of the south of the south. 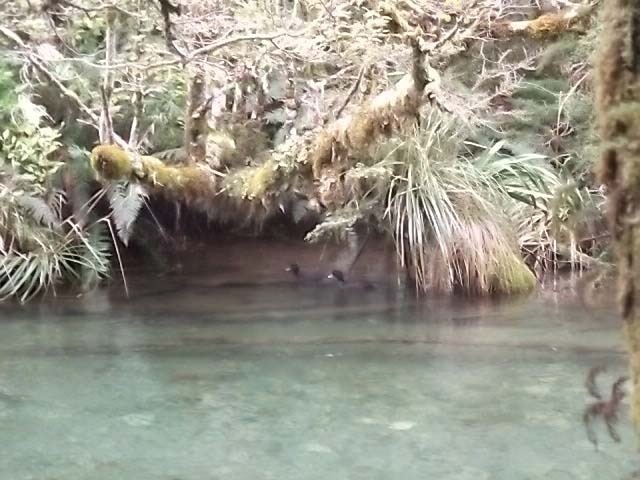 We chatted with them for some time, exchanging good spots to park up and enjoying their tales of lighting a fire beside Lake Gunn and making damper-on-a stick the previous night. It is so nice to hear that such traditions are being kept and the PC brigade have not ruined these activities….yet! 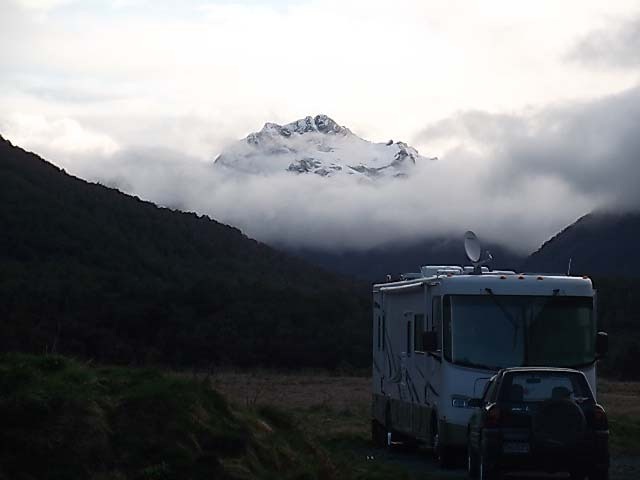 We spent most of the day in and around the town of Te Anau before heading off to our park up spot for the night. 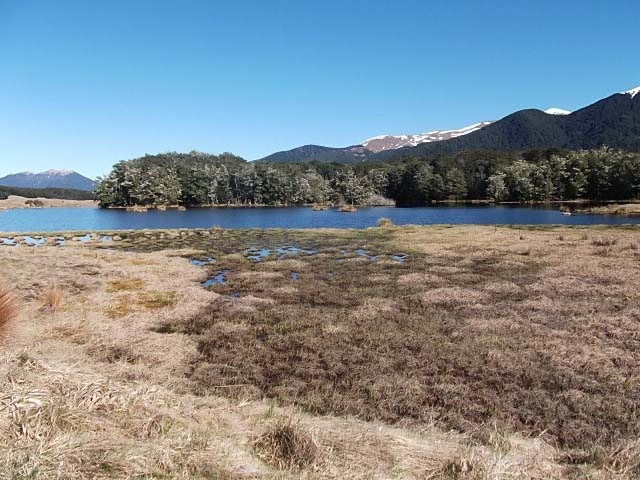 This time just 6 km from Te Anau at Queens Reach Conservation Area off State Highway 95 between Te Anau and Manapouri. 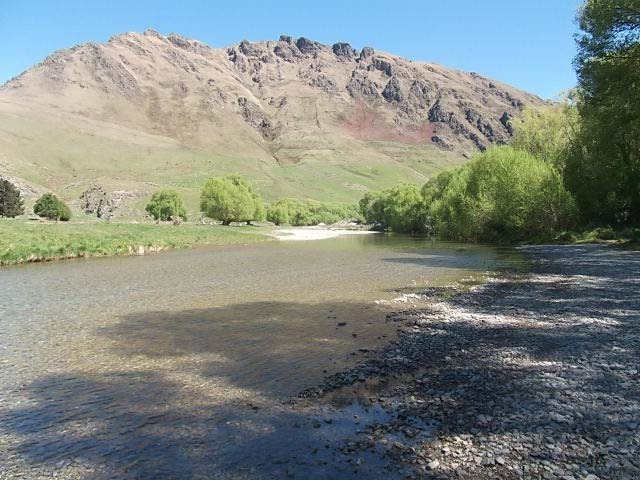 There are lots of camping spots beside the Waiau River and there are at least 4 other campers in the area. We spent some time in the late afternoon walking around the Area looking at all the sights. 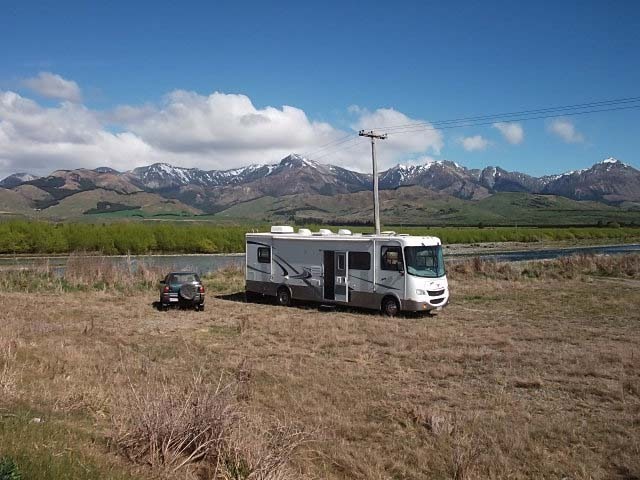 And some sights were a little more than what we bargained for – a couple camped in a people mover type of vehicle, stripped bare, washing in the river!!! These Beech tress have no support beneath the roots. Not sure what is holding them up. Tonight’s dinner will not be quite so late, as it is one of the lamb shanks left from last night stripped off the bone mixed in with the sauce and served with some yummy pasta. Oh and by the time we were heading off to bed, we were joined by at least another 9 campervans plus at least one couple under canvas (and it has started to rain!). View from our parking spot at Whitestone Bridge when some of the party are up at day break, if not before. The rest of the party prefers this hour of the day, is this the start of the Long White Cloud? 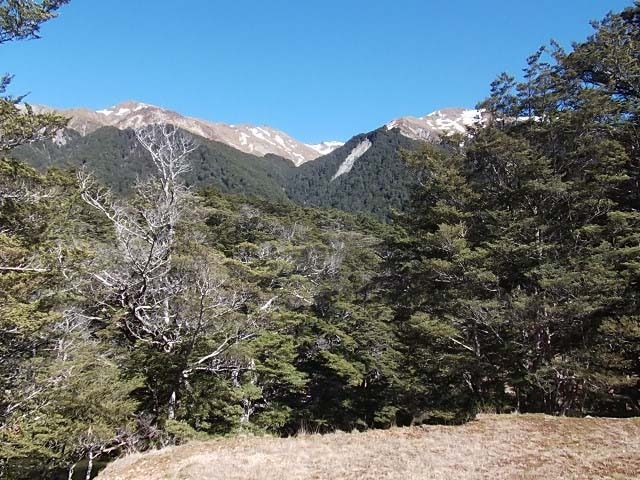 A stunningly beautiful day today so we headed off to Mavora Lakes for a bit of a reconnoitre to see if it is feasible to get the van in there safely. 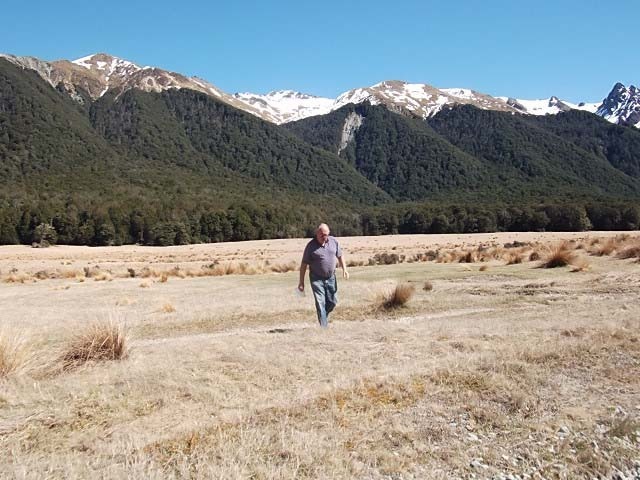 The first time we heard of Mavora Lakes was from Jacky’s Dad David, when many years ago he told of us a camping trip he took there and how it was such a beautiful place and that we should explore the area. 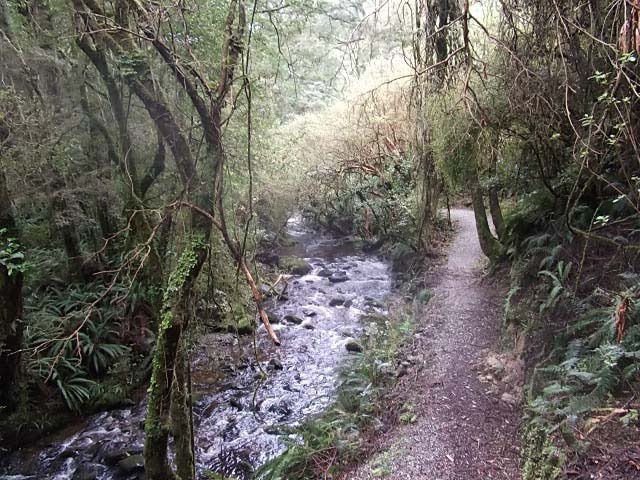 With many other people also extolling the beauty of the region, we thought today was a good day to explore. Signpost part of the way in. But with a vista like this, who could complain? 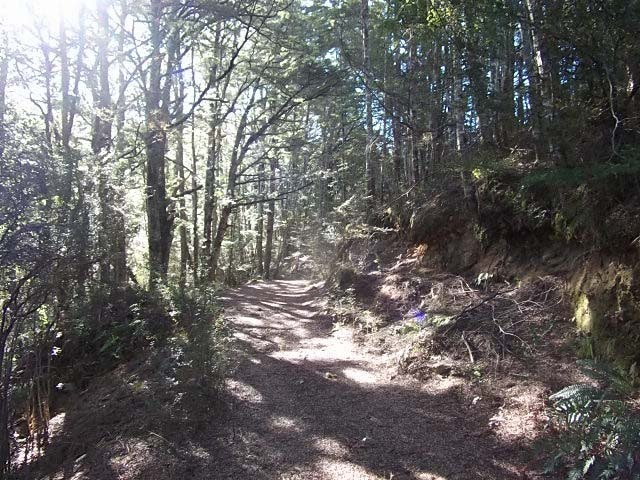 Arrival at the Lakes through Beech forest. 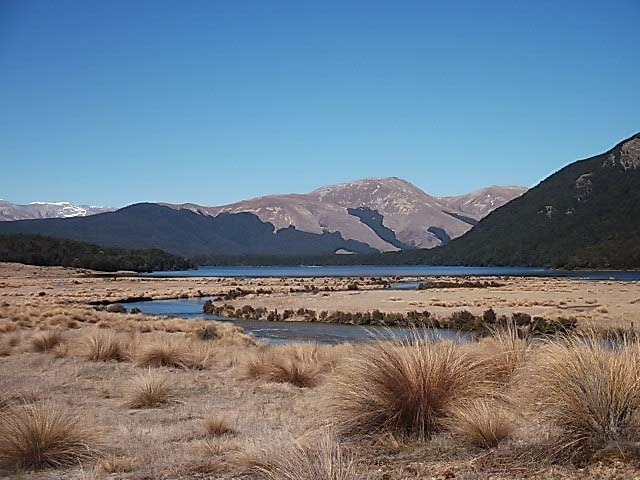 and view to South Mavora Lake from the north end. No motor powered boats are allowed on this lake. 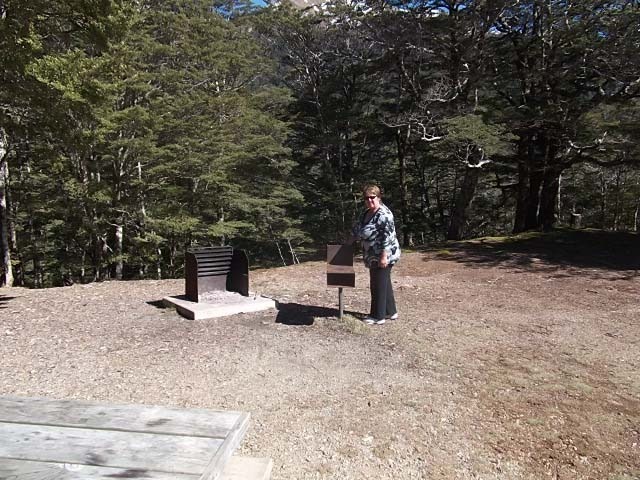 Checking out the BBQ facilities at one of the many camping areas. All of which had a toilet, seating, fire pit and bbq. The whole area is clean and tidy (at least at this time of year). 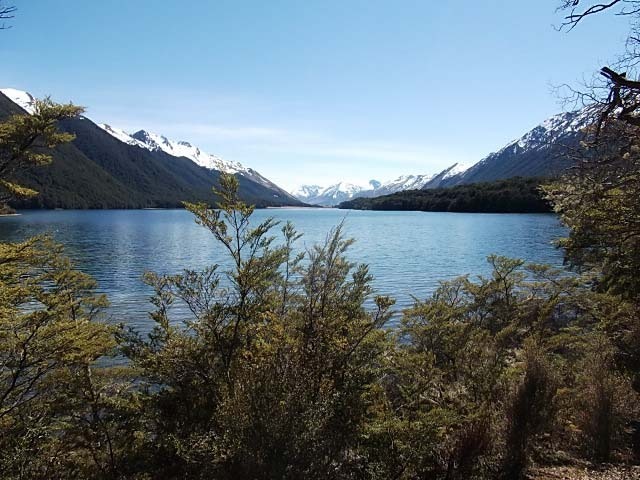 and the view looking up North Mavora Lake. 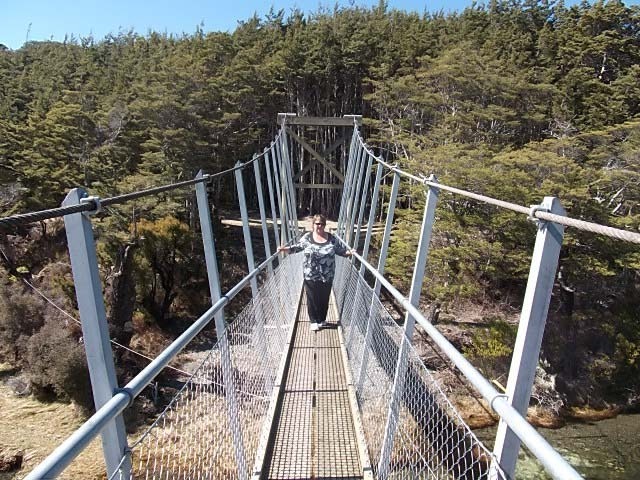 Bernice about to negotiate the swing bridge. 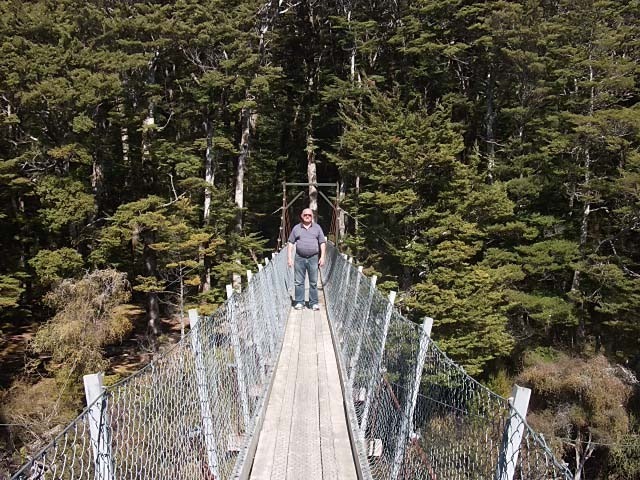 Yes, Roy made it over the bridge……. and I only jumped to make it swing a few times, honest! View from the other side of the bridge where we also found a sign telling us it was a 2.5 hour walk to the next bridge. View of the bridge from a short walk along the shore line. 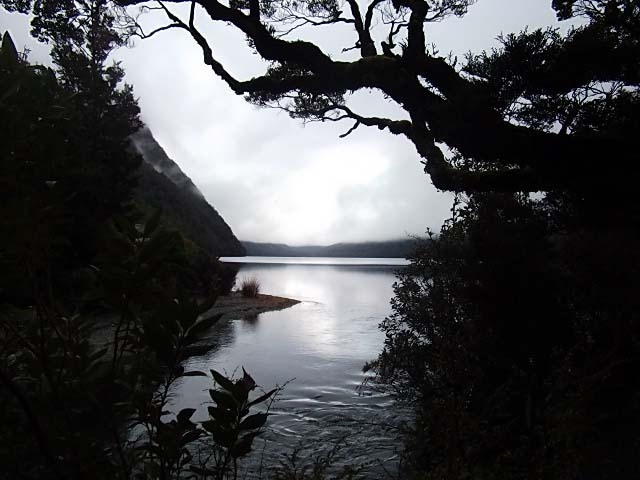 and the view looking north from the campsites on North Mavora Lake. We will definitely return to stay a while here. 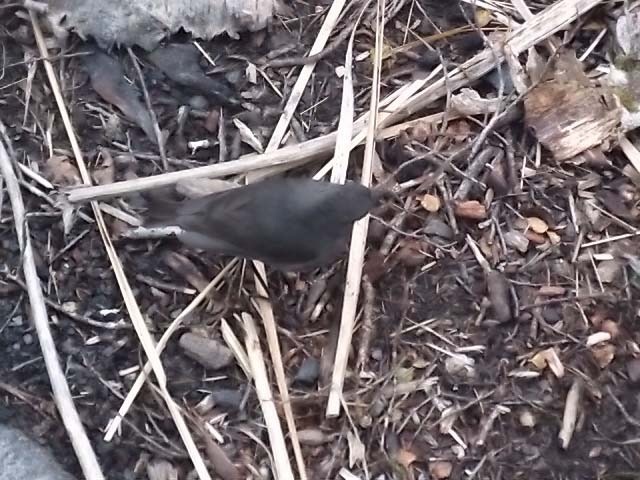 Being a “tidy kiwi” picking up rubbish left behind by others..tut, tut. 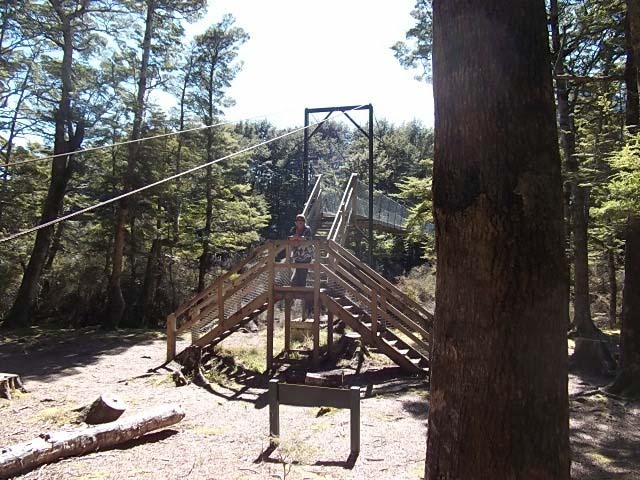 This is the second swing bridge, just a short 10 minute drive which is a bit quicker than the suggested 2.5 hour walk. 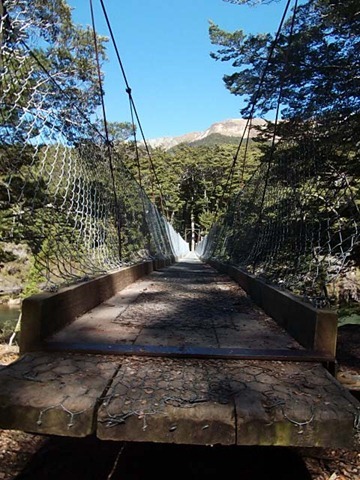 Looking along the bridge walkway. On the way back, we found this black lamb, one of triplets with his siblings of the usual white variety. 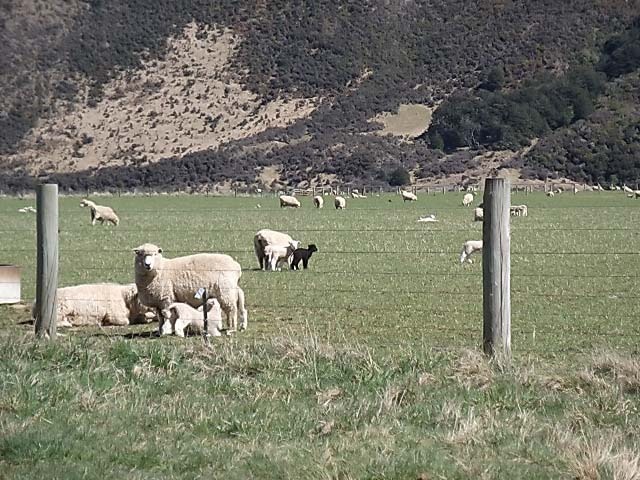 It was interesting to note that in all of the large number of paddocks we passed almost every one had at least one black or piebald lamb. Obviously a recessive gene gets through occasionally. Once we got back to the van, it was tidy up time and also time for a bit of baking, ginger nuts and choc chip cookies. But the following sight is such a rare event, photographic evidence was necessary!! Roy cleaning out the RAV! 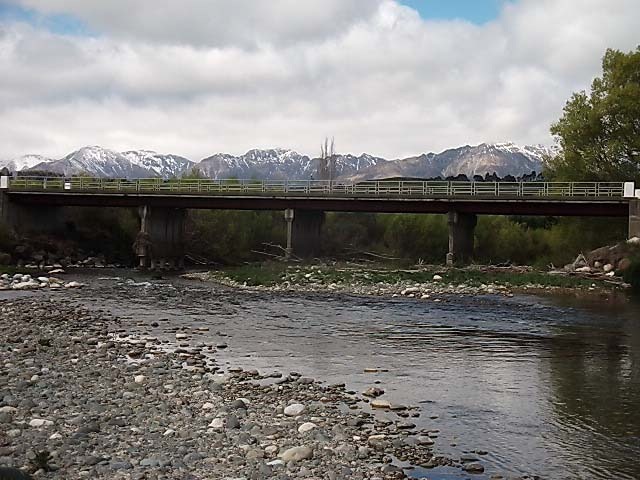 A’ ‘huge’ effort today, as we were moving from our comfortable spot near Arrowtown. So after fond farewells to our hosts, we pack up and move off. 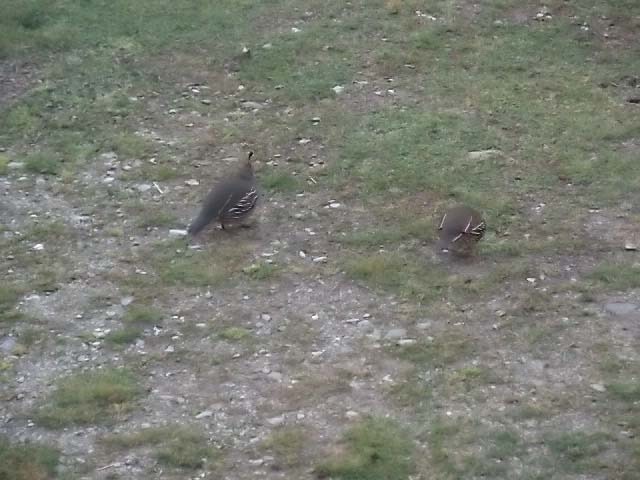 But not before the morning appearance of two regular visitors. They did not end up in the pot!! 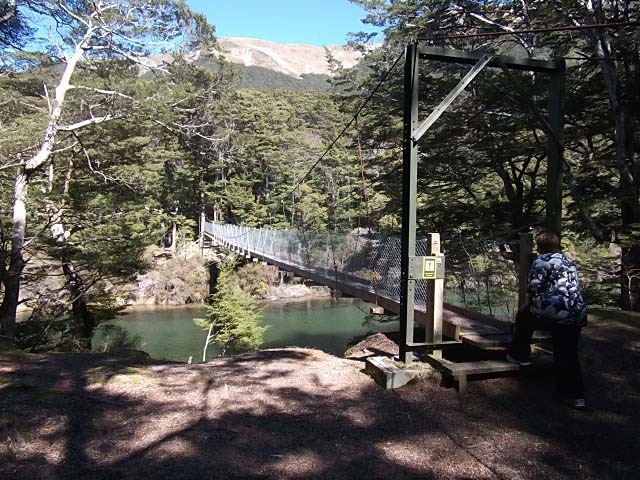 Another stunning day and across the Shotover River we go. I am not sure if I have mentioned before that being in the passenger seat can be rather nerve wracking at times…well, the edge of the road/bridge/cliff sometimes seem awfully close. So one does what one can by trying to focus on the scenery. 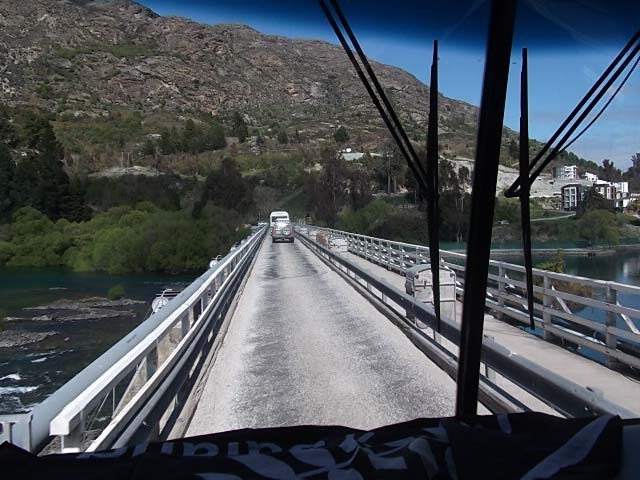 But then another damn narrow bridge comes along, this time the bridge across the Kawarau River. One was told to close ones eyes as we headed across this one! Then onto more stunning scenery. 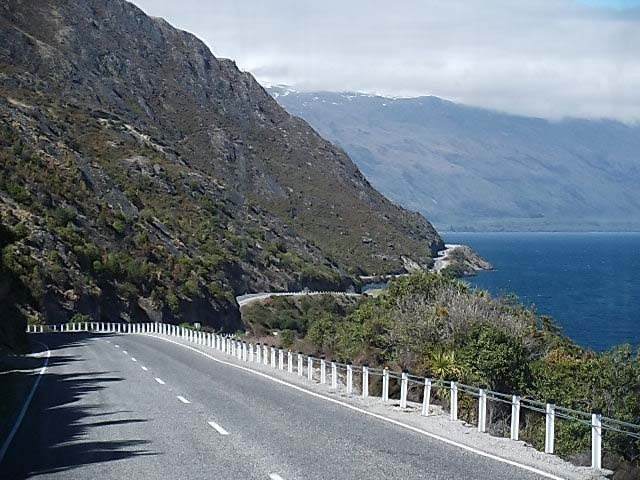 The road weaves its way around the edge of Lake Wakitipu, some of these scenes are reminiscent of the roads around Italy! 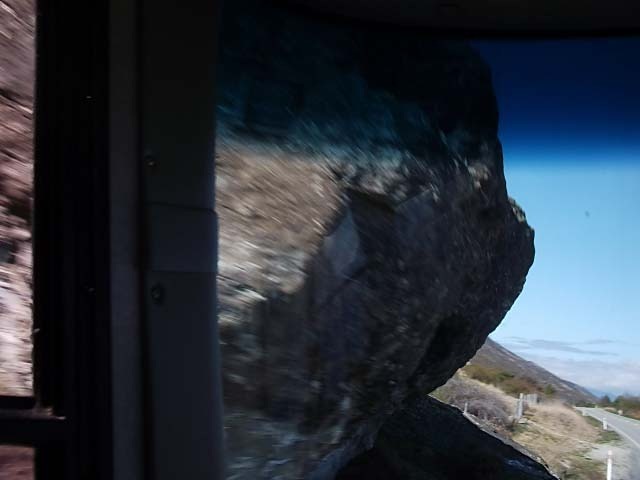 Of course there are some narrow spots with overhanging rock. 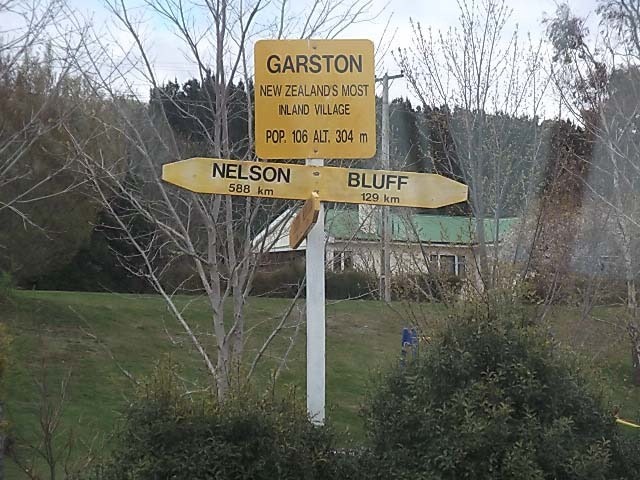 A quick stop at Garston, a town which has the distinction of being New Zealand’s most inland village, but not much more. 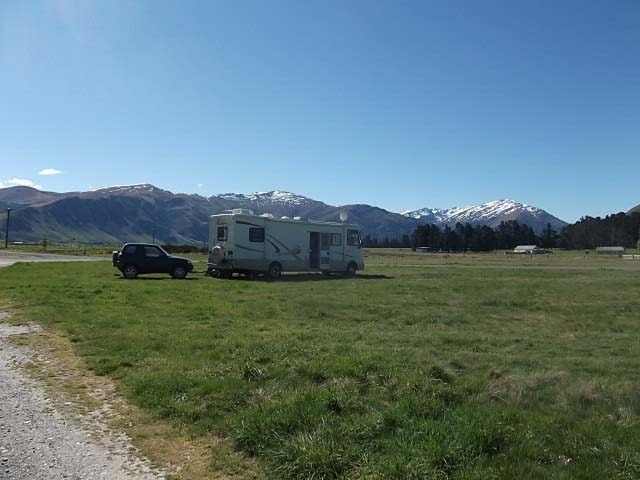 Then on to Lumsden, another brief stop here to avail ourselves of the Campervan Dump Station, and a very good one it is too. Amazing how our focus in life changes over time, now we search out good Dump Stations. Where good = accessible for large vehicles, clean, with drinking water available, easy to get in and out of. 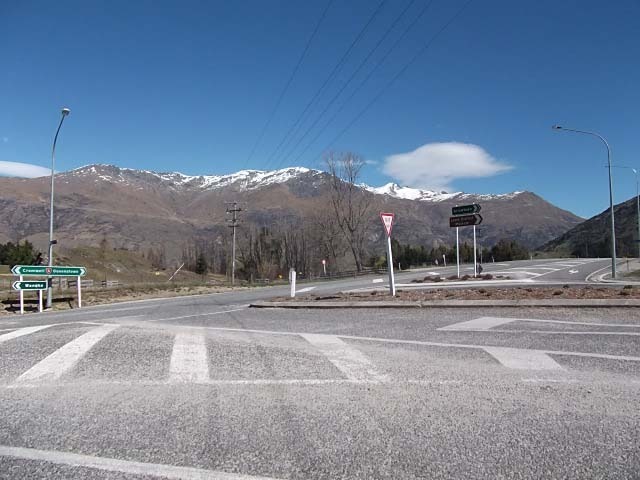 Note Queenstown region, you have no accessible or well notified Dump Stations and you wonder why you have problems?? 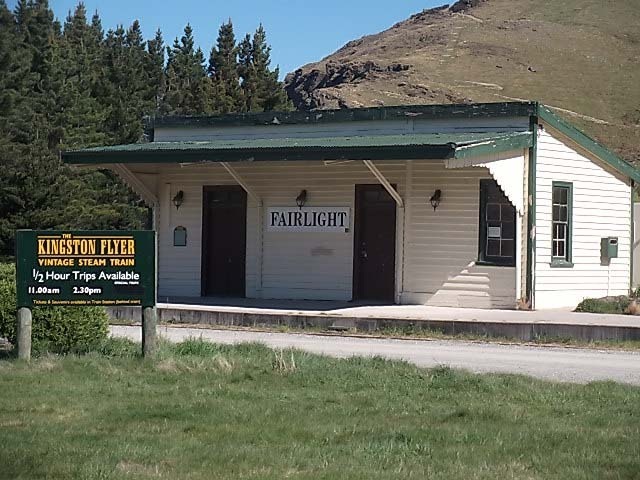 There is one at the BP Station in Frankton however, there is no signage, it is near impossible to get near to it, and even more impossible to get out of the station if you could gain access to it plus there is the lack of potable water. 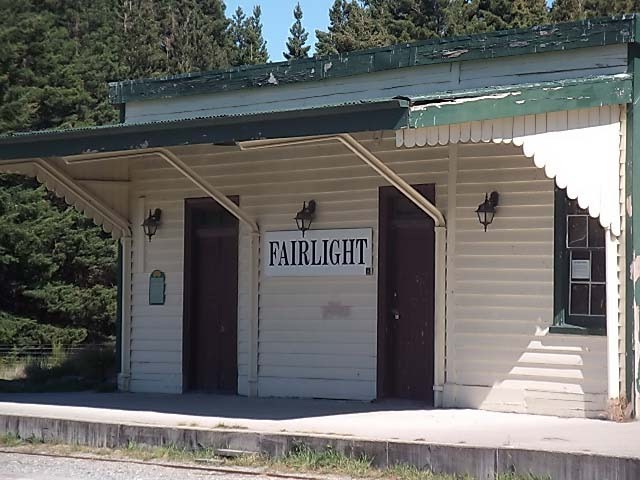 Some towns have excellent facilities, heads up to Wanaka, Oamaru, Lumsden (yes, Lumsden), Timaru, Tauranga, and many more. Our other focus in life is power, as in how much we are generating or using, what amp hours are used by which appliance, how many amp hours until we are back up to full power….. its all a big learning curve. Do I need to turn on the generator to run the cake mixer? How about the iron? Yes folks, I still iron the sheets, tea towels and everything else, its hard to change some habits! Oh and Roy gets antsy when our power capacity drops below 80% full!! But I digress. 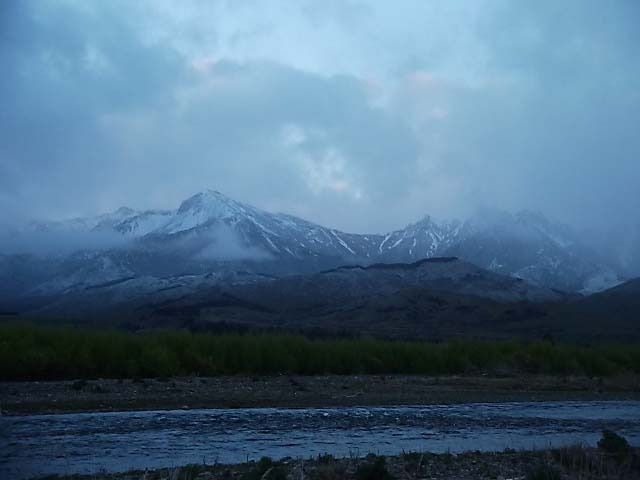 The early morning view of the same range. Another move today, this one just 11kms down the road from last nights stopover. 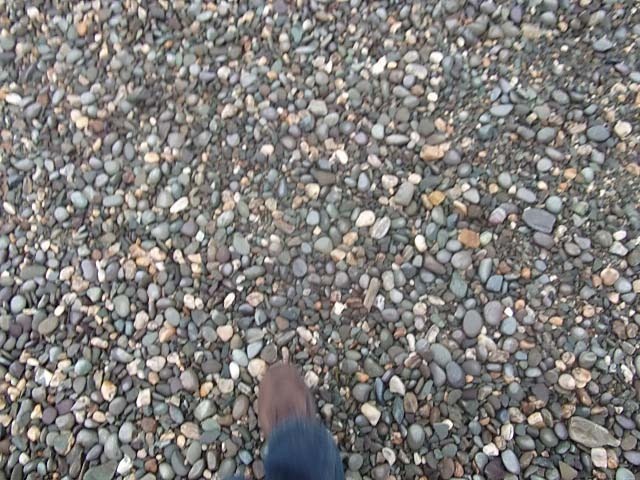 We had no phone or internet reception at the last spot, or at best intermittent reception. 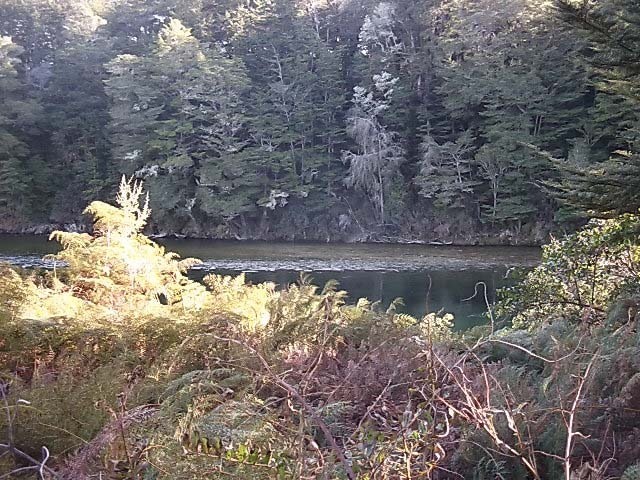 So now we are parked up alongside another river, Whitestone River, on the Manapouri Road. 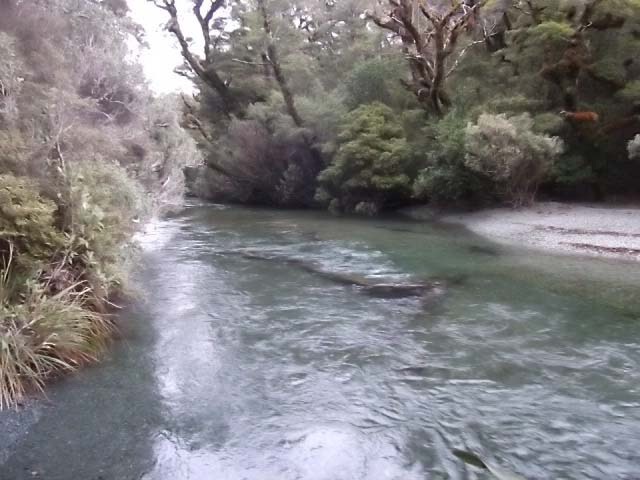 This river feeds into the Mararoa River and is a lovely quiet spot well off the road and with phone reception. Oh and of course TV reception as we need to watch the rugby tonight and tomorrow night. Bread is in the oven baking. We bought a loaf of bread yesterday as we thought it may make a nice change. How wrong were we? 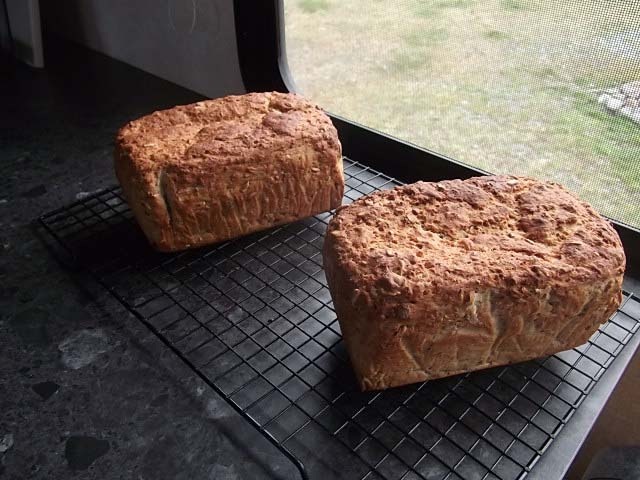 It was tasteless, unsubstantial fluff which was supposed to be a wholegrain loaf. Back to baking my much nicer, tastier, more satisfying loaves that also last longer, with an easy recipe which requires no kneading. Ask me nicely and I will post the recipe!! 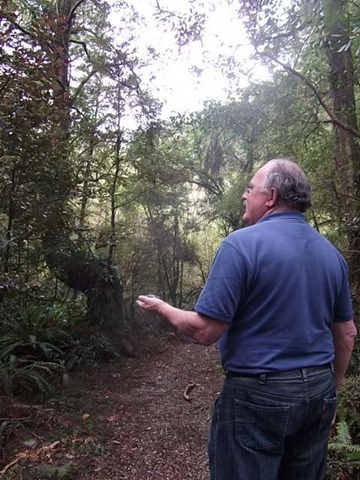 There is a scientific reserve on the road which links Lumsden and Te Anau. 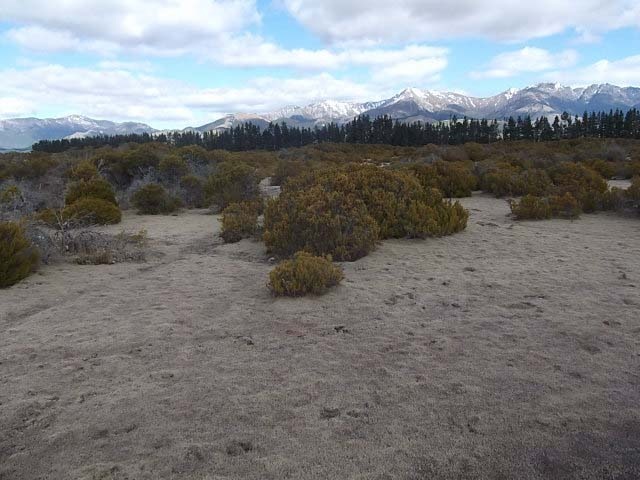 We stopped to have a look and found that it was an area of preserved native flora and fauna much as it has been for several thousand years. 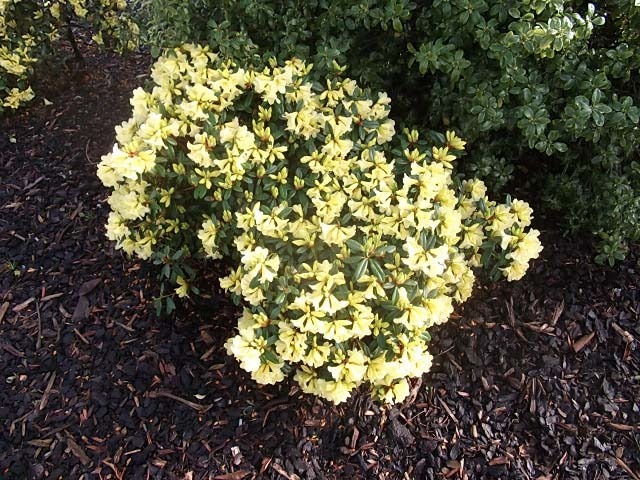 The small scrubby looking plants are in fact native conifers which are very slow growing in this environment. 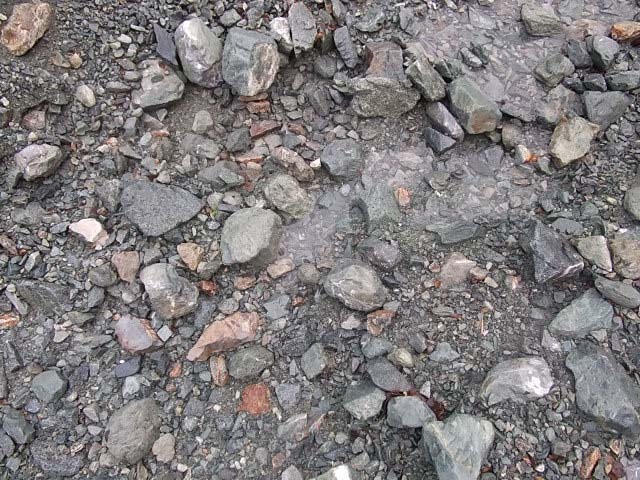 The larger ones may be between 100 and 200 years old. 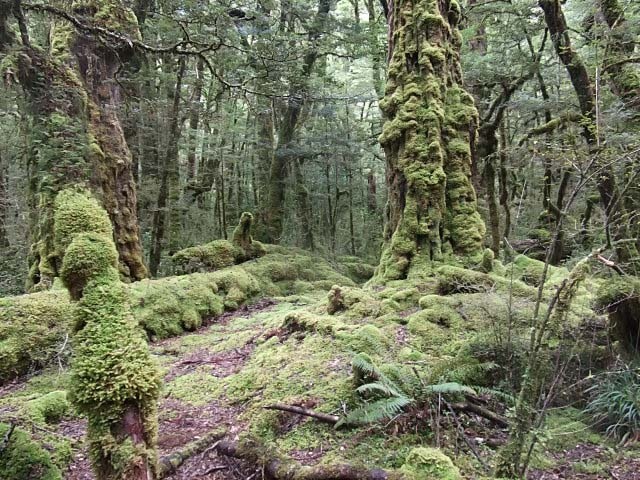 The ground is totally covered by moss. 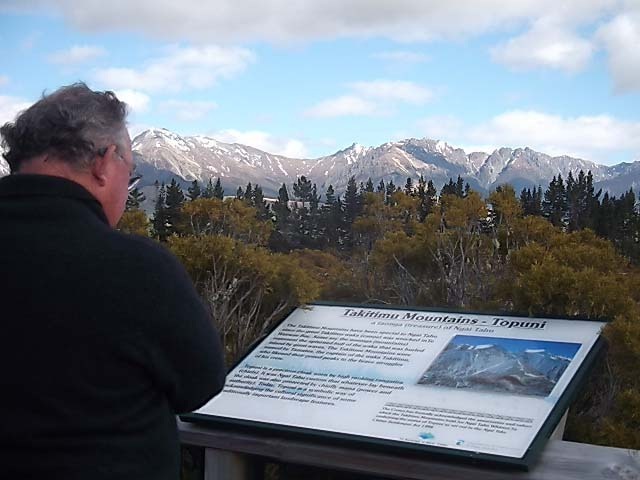 Looking toward the Takitimu Range from the lookout at the reserve (all of 8 feet higher than the rest of the ground. 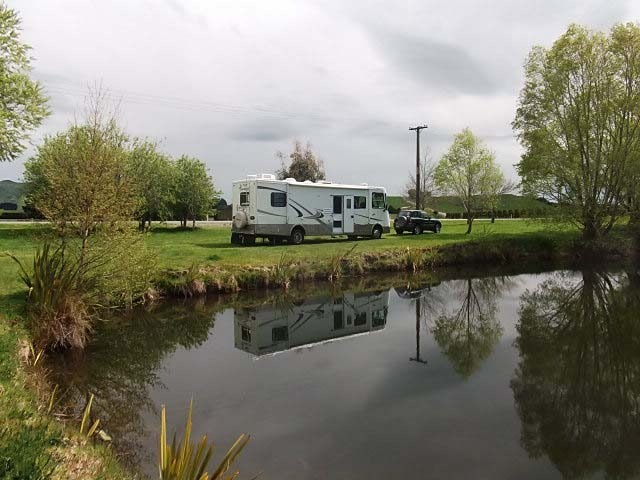 We will stay here for a day or two before heading in to Te Anau, where we hope our mail will have arrived (thanx Mike & Ann) and we can also catch up with a couple of clients before we head out towards Milford. I am not sure what we have done for the past 4 or 5 days but all of a sudden here we are and it is Thursday. Oh and Thursday means that its netball watching tonight! And we were joined at the POP by another couple for two nights. It has been lovely meeting lots of new people, to exchange ideas, discuss good parking up spots as well as looking at other vans. Now this is what an office view should look like. And this is a view of where we are parked. 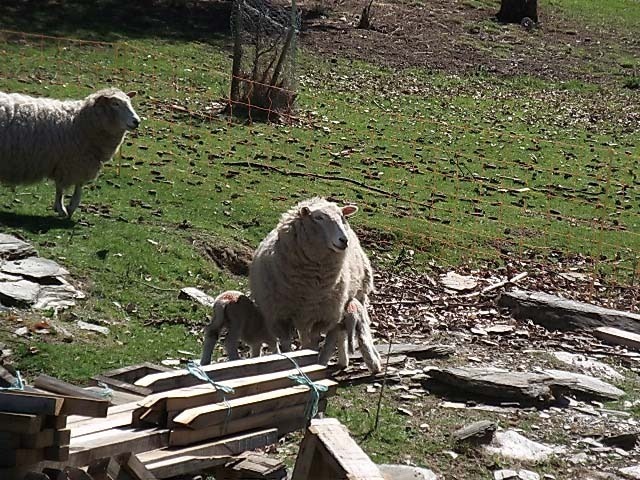 Yesterday all of the sheep and their lambs were moved from the paddock by the expedient of removing the electric fence separating them from the next paddock. This also meant that the chooks were able to come and visit to look at what might be on offer. 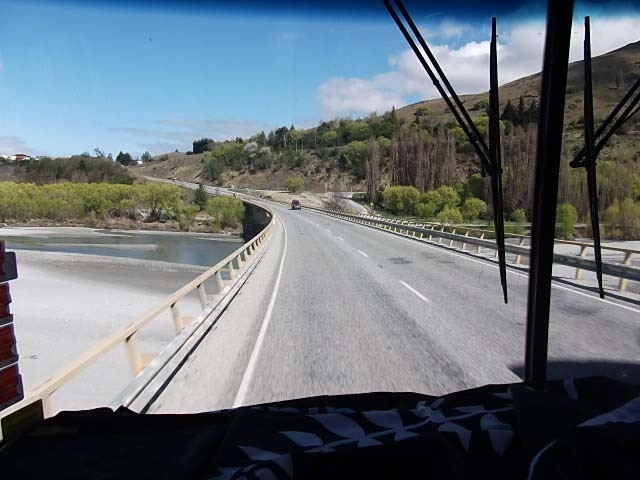 Tomorrow we will pack up and head off toward Te Anau, not sure if we will get the whole way there tomorrow but we intend to be around that area for at least a week. If the weather continues as it has been all this week, we shall have to break out the sunscreen. What to do on a Saturday as the weather seemed to close in on the day? Hop in the car and head for the aptly named The Lazy Dog where sat in front of a roaring fire, watching the rain beat down outside with a tray of five wines in front of us to taste, that’s what you do. The wines were so good that we decided we may have to try another 5 wines, so another tray was quickly sorted and duly tasted. We have been doing quite well depleting our cellar over the previous few weeks so now we are adding a few back! We can certainly highly recommend a trip to The Lazy Dog, in Queensbury which is on the Cromwell/Luggate road. 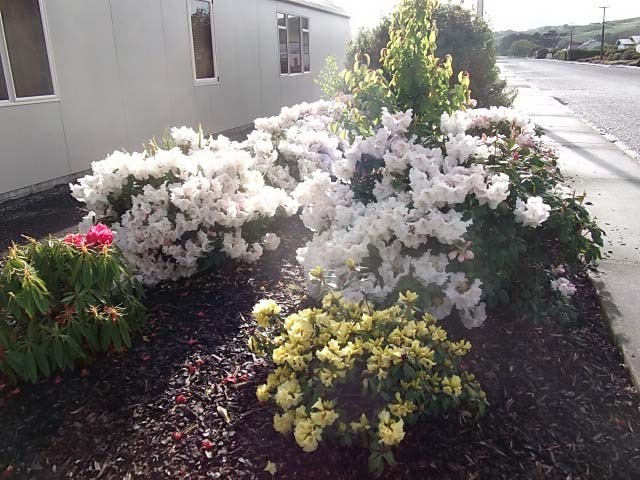 The owners are knowledgeable and passionate about both food and wine, they have lived and travelled extensively and now have a lovely few acres which they have landscaped beautifully to share with people. Back to the van with purchases in tow, it was soon time for dinner and a movie. It rained steadily through the night but by morning it was clearing nicely. 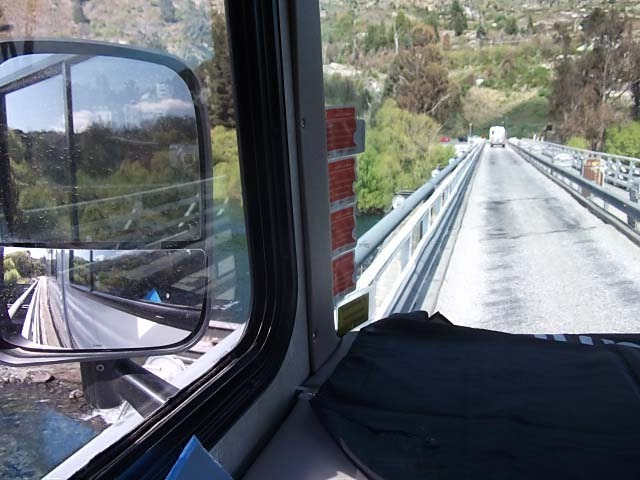 The van was packed up and we headed off into Cromwell to the Dump Station, filled up with water and fuel and headed off again, this time to a POP just out of Arrowtown. 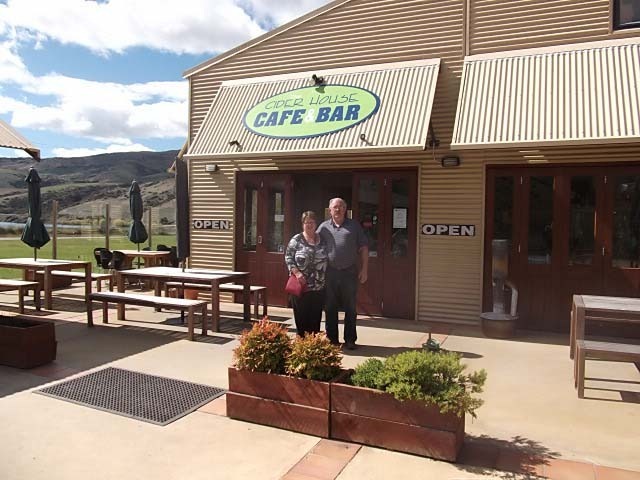 Farewells were bade to our hosts Gordon and Doreen, we would highly recommend their POP to any MZMCA members reading this blog, #2143 in the current book. Yes,we know that we are not travelling far, but this is the whole purpose of this chapter of our lives. 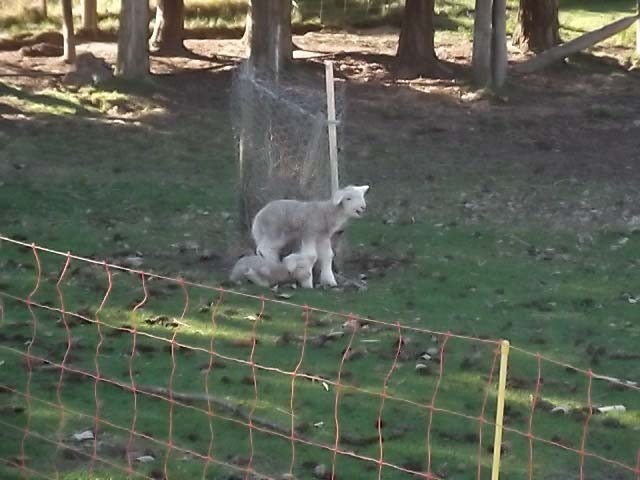 We arrived at the parking spot in time to witness the birth of a couple of lambs and have spent the afternoon watching and laughing at the escapades of young lambs cavorting around us. and the rest of the views are just as picturesque. We intend basing ourselves here for a few days whilst we head off in the Rav4 exploring the area. We also have to wait for one of Roy’s hearing aids to be repaired which should be done by Wednesday. Meanwhile, more baking has been done (bread and biscuits) and the All Blacks cheered on. Tonight’s game Italy vs Irelend poses a conundrum – who to cheer for? Roy’s Irish grandmother married his Italian grandfather ….what a fiery mix! 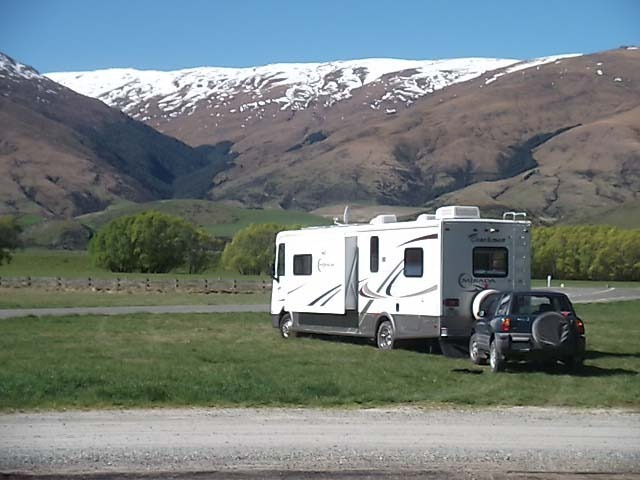 We are happily settled here just out of Cromwell and will be staying put for a few days at least. This gives us a chance to have a good look around the area and also to catch up on a few wee tasks. 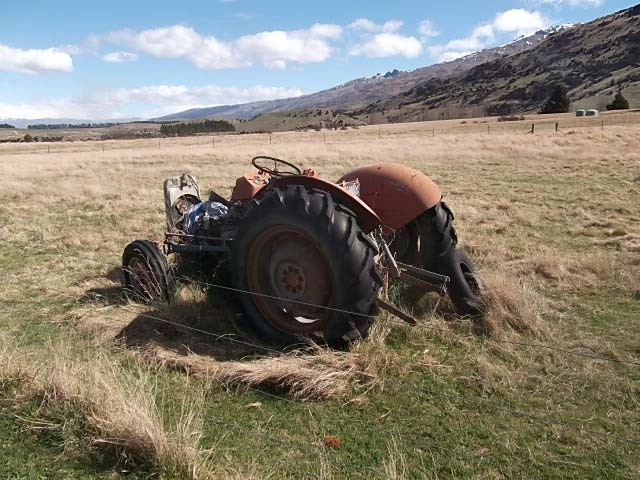 The ubiquitous red tractor abandoned but not forgotten in the paddock next to where we are parked. Last night we had a lovely roast of pork with all the usual trimmings, the oven is now well christened. 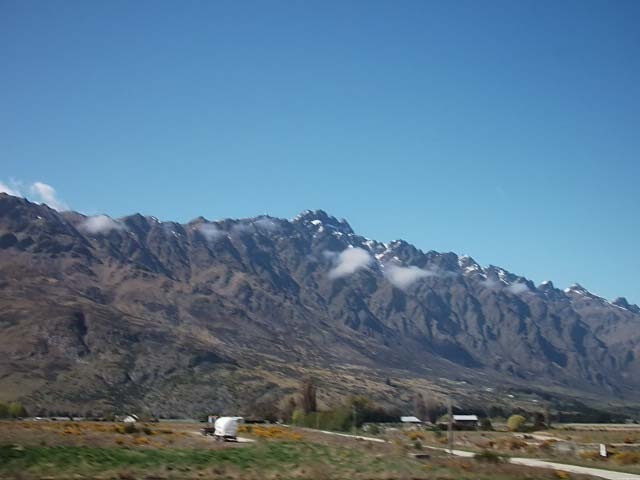 Morning tasks done, it was time to head into Cromwell for a wee bit of a look around. On a trip to Mitre 10 for a couple of ‘essential’ bits, Bernice met up with the owner Glenda who just happened to be on her recent trip to the Netball World Champs in Singapore. After a quick catch up, we were invited to Glenda’s for dinner on Friday night, something to look forward to. We are in charge of the wine supplies, so a bit of reconnaissance work visiting a few vineyards, doing a little bit of quality control tasting is called for over the next few days. 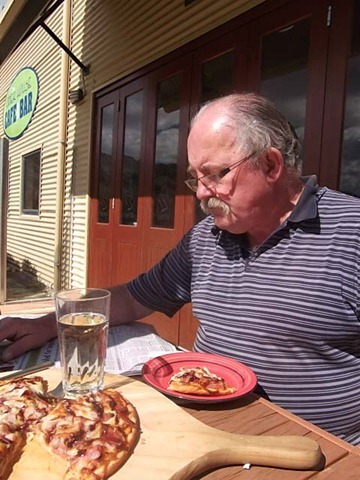 Soon it was time for a spot of lunch, although it is only Wednesday, we thought that it was only fitting that we have a Pizza and Cider at the Cider House – especially for Antony & Alex! And delicious it was too, sitting out in the warm sun enjoying the atmosphere. 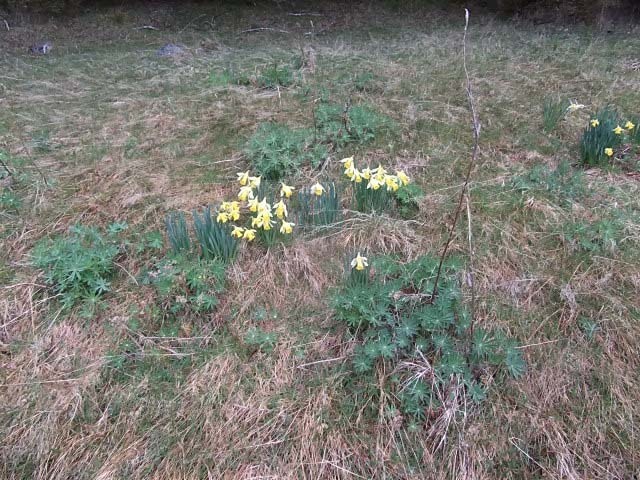 Then it was off down the road to Wooing Tree – just for Bill & Linda. Back to the van, and a late afternoon of relaxing, reading and watching/listening to the local rabbit hunt going on. 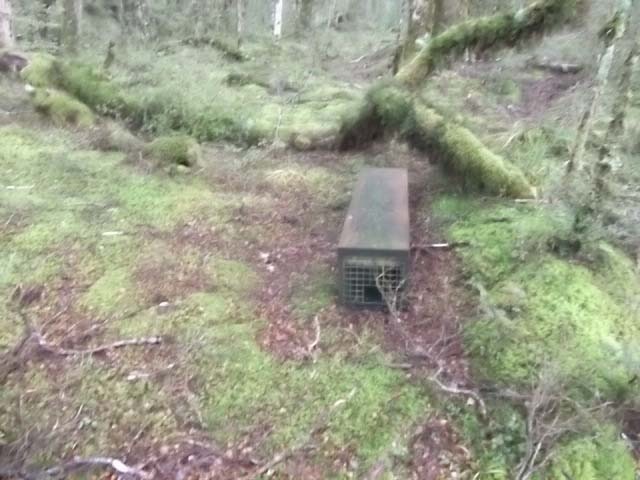 This is done via helicopter, with the shooter taking shots at the rabbits from overhead. Apparently this is an efficient method of rabbit control as the rabbits come out into the open and stay very still as the “big bird” flies overhead, making them a reasonably easy target. This went on all afternoon. Bernice decided to try out her oven at baking, oh, and also try the cake mixer (without being hooked up to mains power that is). A batch of ginger nuts was made, and after a few tweaks with oven temperatures and shelf heights, a perfect batch of ginger nuts were made. 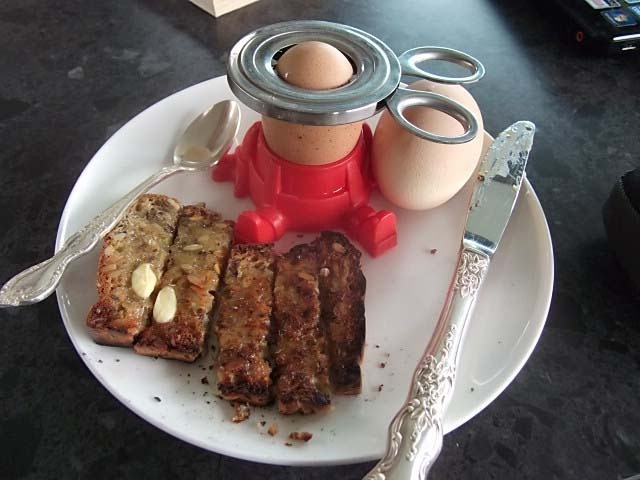 Damn, now we have to eat them! Today we have a few tasks to attend to, Roy has showed his skill by changing a couple of the light fittings around and getting rid of the silly, dangly, light fitting over our armchairs. We used a fitting purloined from another part of the van where one was totally unnecessary. Today’s other task is to install a guide roller to the sliding door between the front of the van and the bathroom area, and putting in the rubber edging along the inside of the slide-out where it was removed during modifications. It is yet another stunning day with not a cloud in the skies. Today’s entertainment was again provided by the helicopter with the rabbit shooters, however, a slight change from yesterday with a pause in the shooting whilst they dropped off someone to capture wayward sheep. 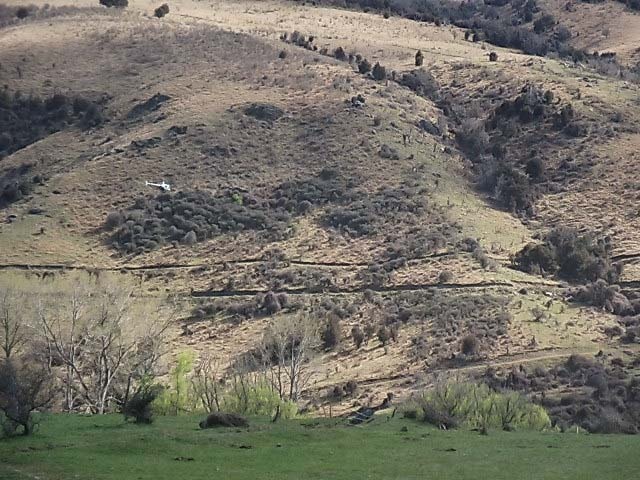 The then hilarious sight of three twitching, terrified sheep dangling underneath the helicopter from ropes being removed to safer areas then rabbit shooting recommencing. Completing the jobs took most of the day, but we now have the last bit of lino laid around the seat, the edging in situ and the rubber seal was measured, cut, glued and screwed into place. All in all, looking very neat and tidy. Another day of wandering and chores including laundry then off to Glenda & Toby’s for dinner with Marie (another Singapore netball fan) joining us. A lovely night was had with plans to meet up again in the next day or two before we set off to points unknown. We are also trying to empty out the “liquor cabinet” by drinking some of the wines we seem to have accumulated over the years, so for the past few days we have been enjoying, with varying success, NZ Rieslings vintage 1999, 2000, 2001 and 2002. We have had only one that had gone past its best, the rest have been drinking beautifully. Who said you cannot cellar whites for more that 3-4 years?